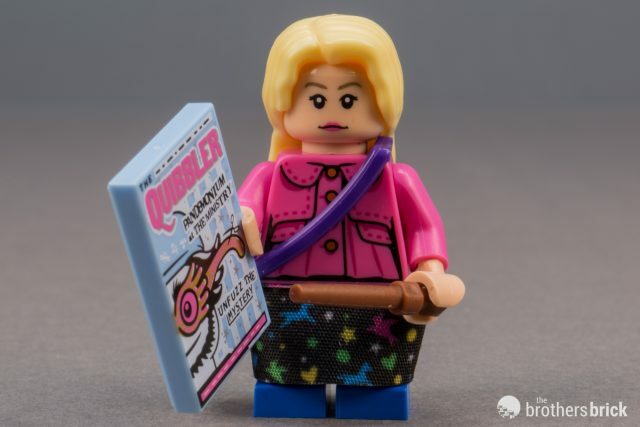 Since LEGO began the Collectible Minifigures theme in 2010, there have been quite a few special series based on licensed properties, from the Simpsons to Team Great Britain to The LEGO Movie. 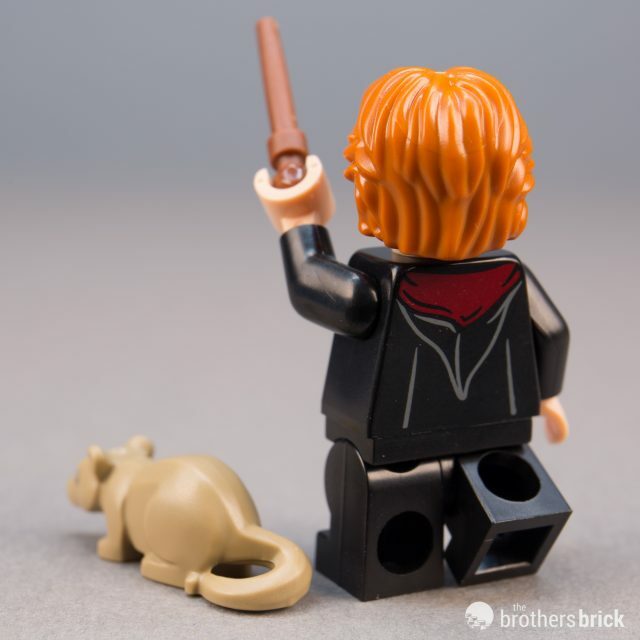 But it’s hard to imagine LEGO could have chosen a theme for their next minifigure line more likely to inspire fans’ devotion than the Wizarding World of Harry Potter and Fantastic Beasts, except perhaps the juggernaut that is Star Wars (and it’s unlikely to become a minifigure line anytime soon). 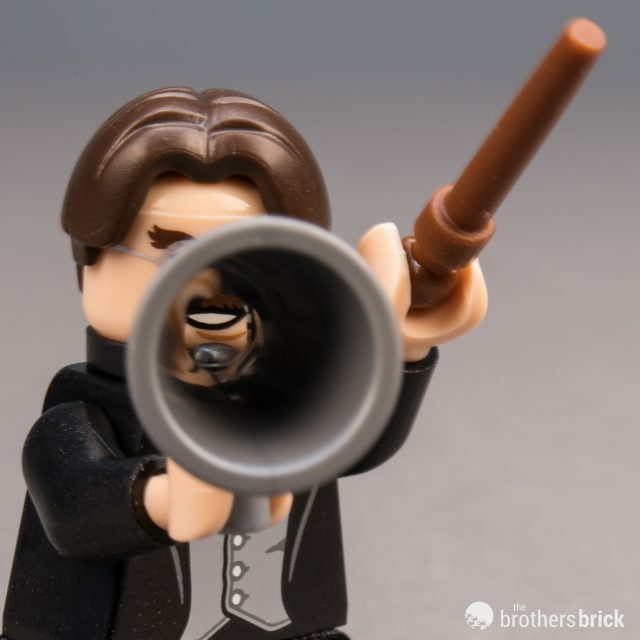 The new theme based on the ultra-popular books and films about magicians and muggles features the greatest number of unique minifigures yet, with a full 22 to collect. 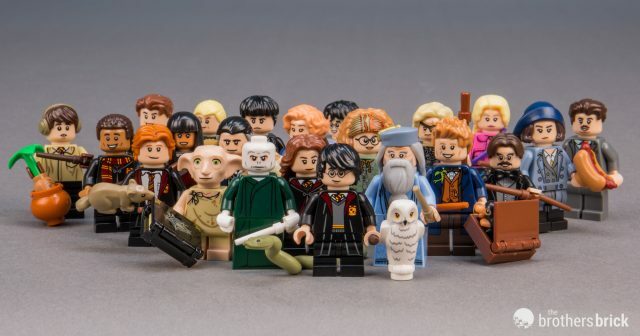 Kept under wraps until an announcement just a few weeks ago, 71022 Harry Potter and Fantastic Beasts Collectible Minifigures are set to launch globally August 1, and they will be priced at $3.99 USD each. As we’ve come to expect, the individual packs are blind, with no external indications of which character they contain. We’ll be publishing a guide in the near future on how to select the characters by feel. 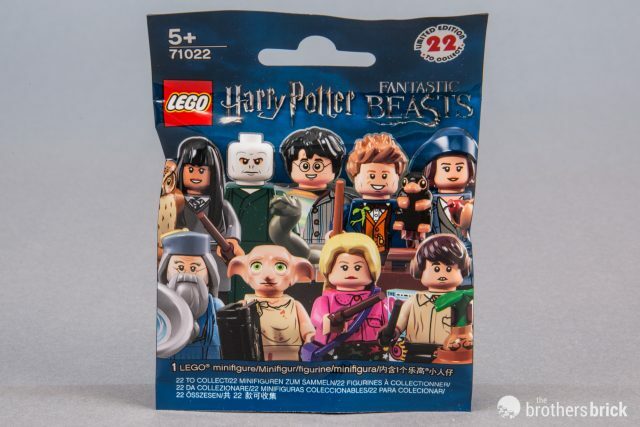 Regardless of contents, each pack shares the logos for both Harry Potter and Fantastic Beasts. Despite there being 22 characters in this series, they come in the standard case of 60, as with nearly all previous series. Of course, this means that there are not three full sets per case, as with the majority of previous series. 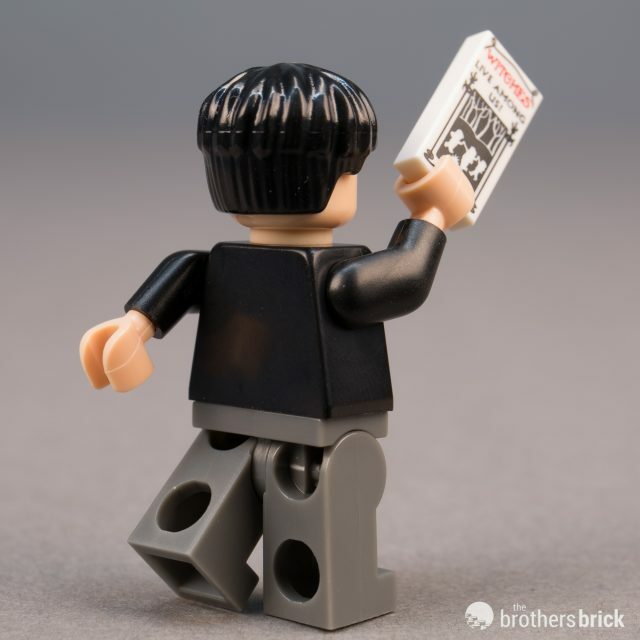 Rather, it follows the lead of Series 18 by including a “chase” minifigure–that is, a character that’s quite rare, with only one per 60 minifigures in a case. In this series, that character is the cunning Percival Graves, Director of Magical Security in Fantastic Beasts and Where to Find Them. 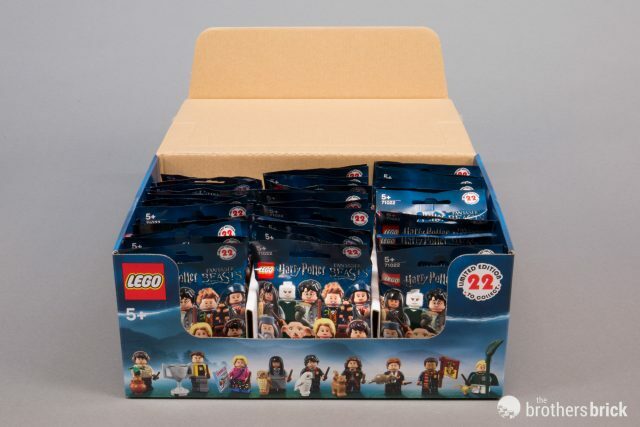 Thus, each case provides only a single complete set of figures. 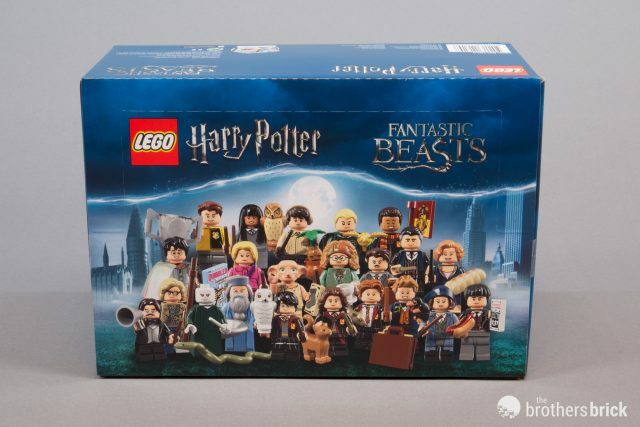 The minifigure line, and indeed the entire new Wizarding World theme, plays host to a multitude of new elements. 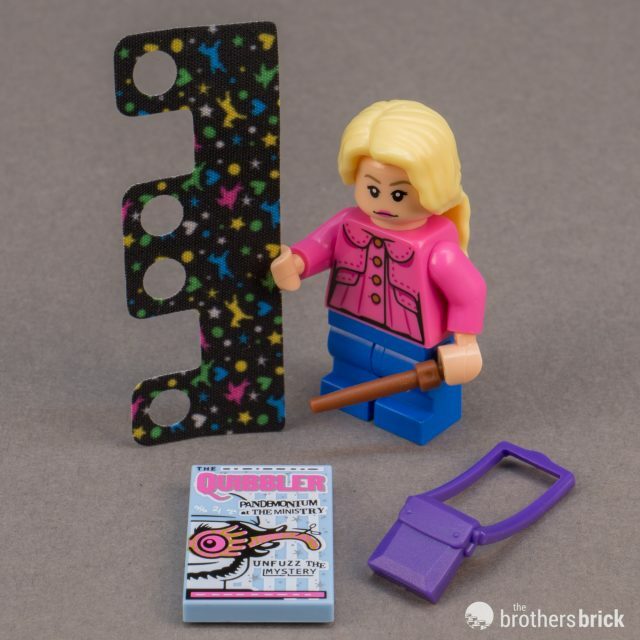 One that sprouts up in every single set and nearly every collectible minifigure (CMF) pack is the new wand. In the CMF line it’s available in six colors, and even more in the other sets. 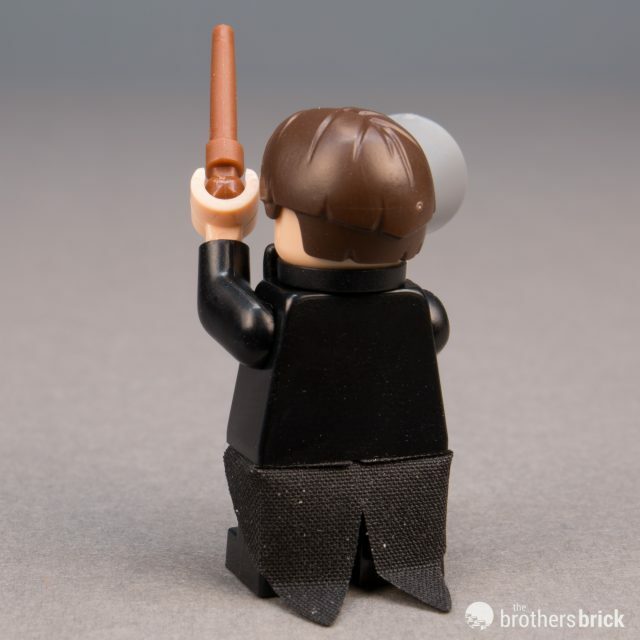 As we discussed in our review of the Hogwarts Great Hall, the wands are a moderately soft plastic and come in pairs attached to a center sprue. 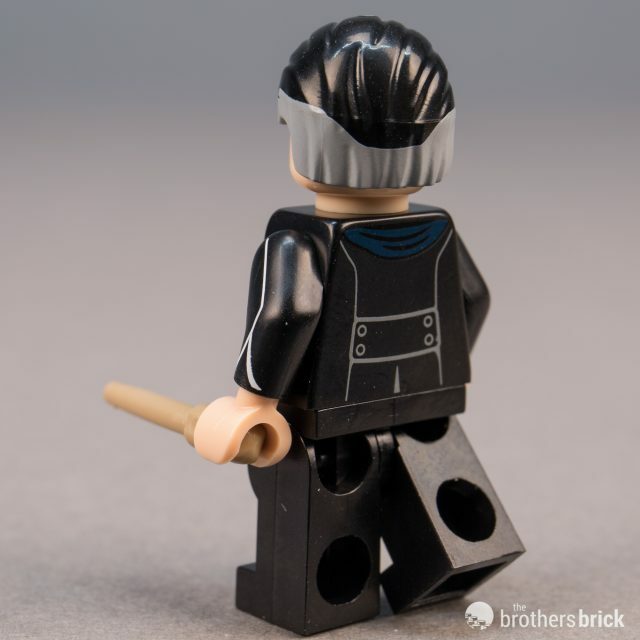 Although in that review we noticed the wands succumbing to minifigure grip marks with alarming ease, that didn’t seem to be as much of a problem with the CMFs. We still noticed a few marks, but they were much less. 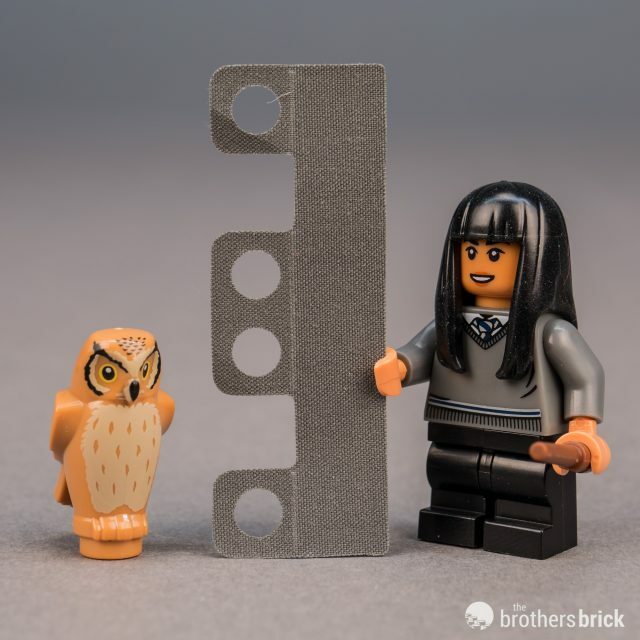 Whether that’s due to a minor difference in the CMF molds or the plastic used, it’s difficult to say, but it’s a good thing since these wands are likely to be the most common. 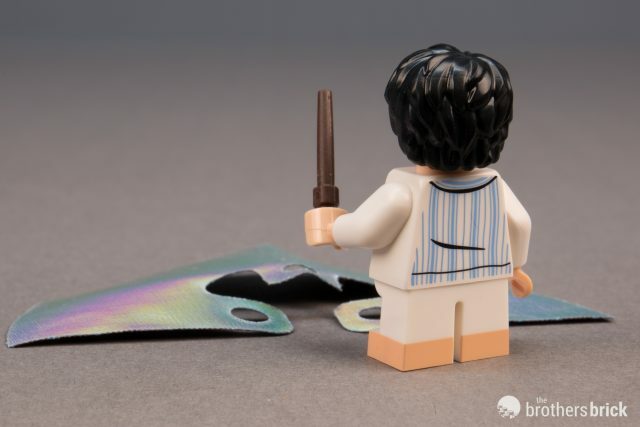 Since a pair is included for every character that wields one, you’ll quickly accumulate extras–more than enough to upgrade any older Harry Potter figures. The other new element that shows up on multiple characters is the “teen” legs. Most of the students in this series use these legs. 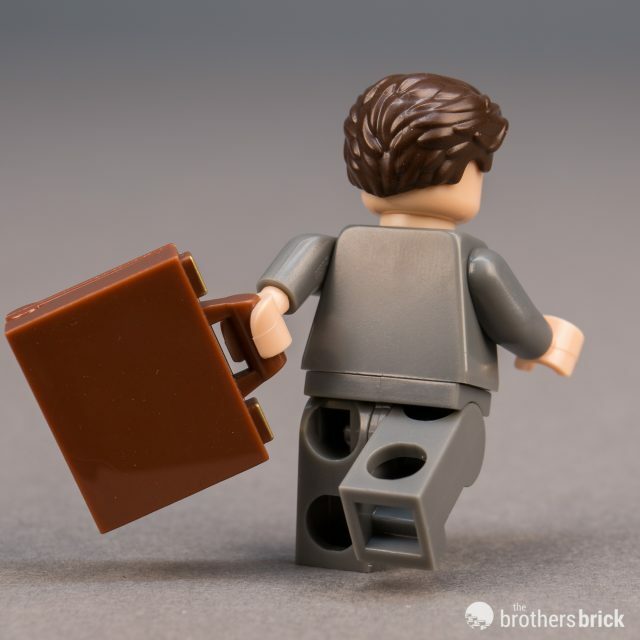 This new style of legs is shorter than traditional minifigure legs, which are five plates tall. Coming in at four plates tall, they’re also taller than short legs, which are just three plates tall. Most excitingly, though, is that they’re bendable and have anti-stud holes on the backs just like the classic legs. 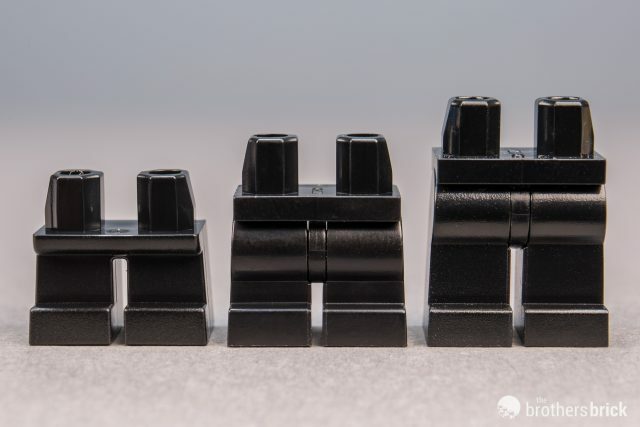 This means a minifigure equipped with these new legs can do all the same things as a classic minifigure, while simply being a little shorter in stature. They can sit on plates or chairs and ride bikes or motorcycles without looking too ungainly. 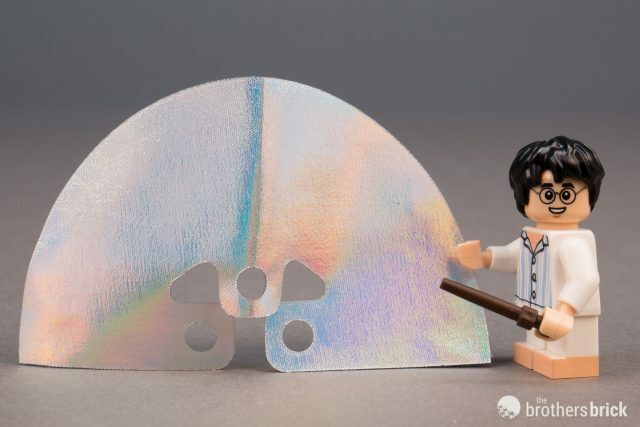 Each character includes an unprinted black minifigure stand and a two-sided paper guide showing the whole series, along with instructions on how to assemble a few of the characters. 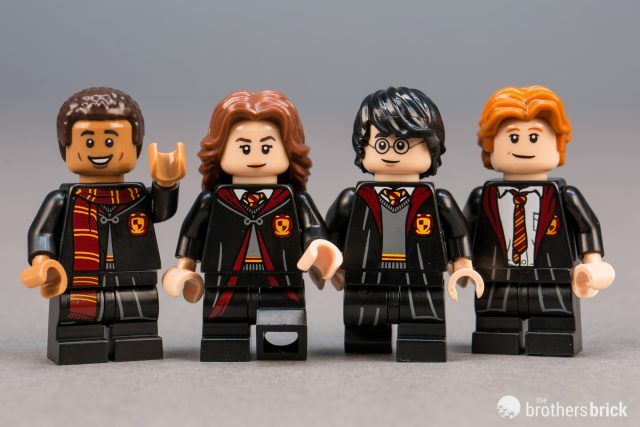 Harry Potter and the other students in this minifigure series are a bit older than the versions in the regular Wizarding World sets currently available, appearing to be from one of the middle movies in the series, mostly Goblet of Fire. 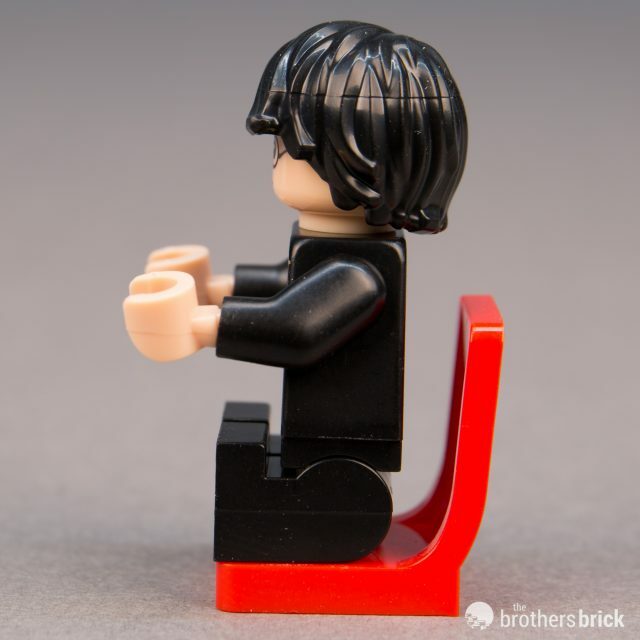 Dressed in black school robes overtop of the grey uniform sweater, Harry features the new teen legs and black, windswept hair. He carries a dark brown wand and is accompanied by Hedwig. 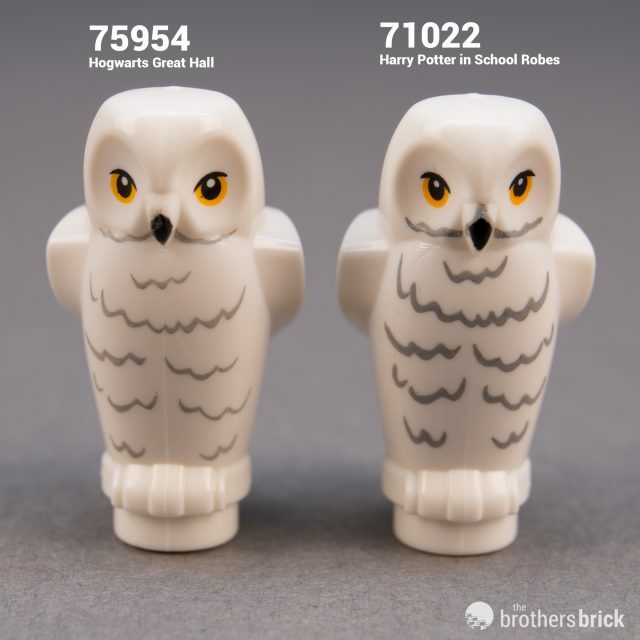 Although very similar, Hedwig is not the same as the one from Hogwarts Great Hall, featuring subtly different printing. 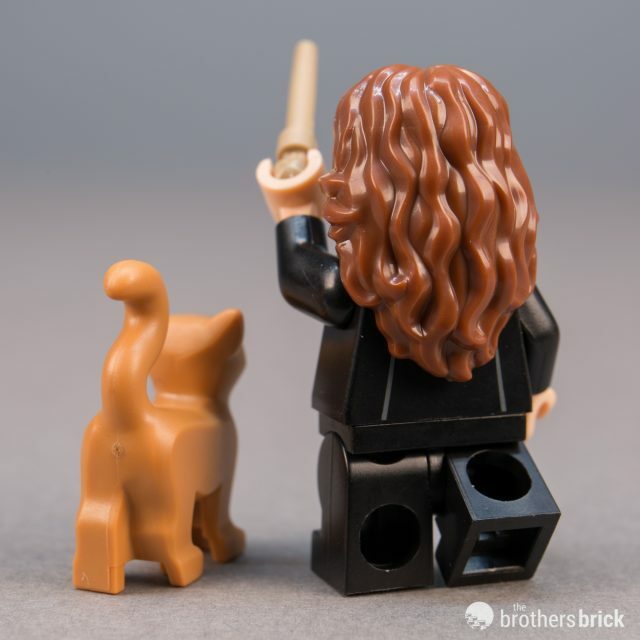 Similarly dressed in the Hogwarts uniform, Hermione wears her robes slightly more formally, clasped at the chest. 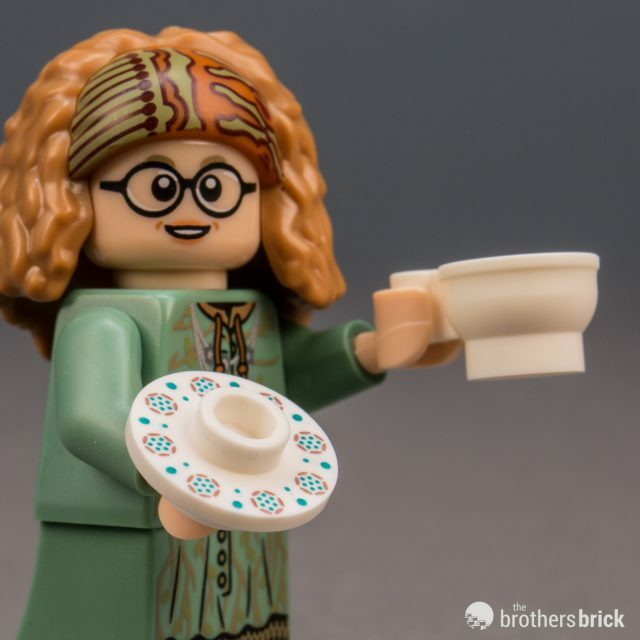 Her long wavy hair is the flowing hairpiece that was introduced first with the Series 2 Pop Star, and it appears here for the first time in brown. 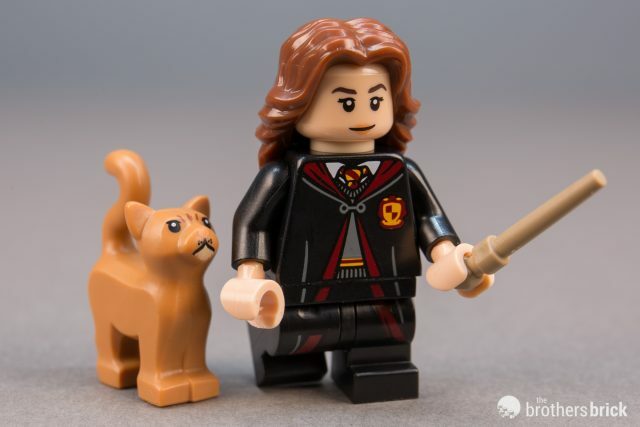 She’s accompanied by her cat Crookshanks, and carries a dark tan wand. Like the other students in uniform, her robe is printed on both sides of the torso. Always a bit disheveled, Ron wears the same uniform as Harry and Hermione but in a tragic state of disarray. His high-parted, dashing hair, borrowed from Han Solo, looks a bit too springy for Ron, making him look a great deal older than he should. 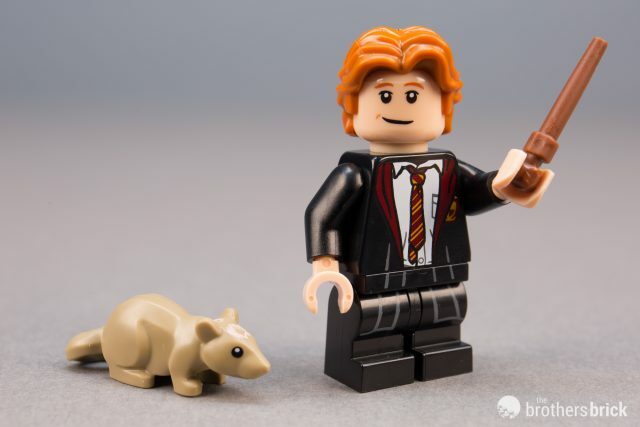 He carries a brown wand and is accompanied by his questionably faithful rat Scabbers. 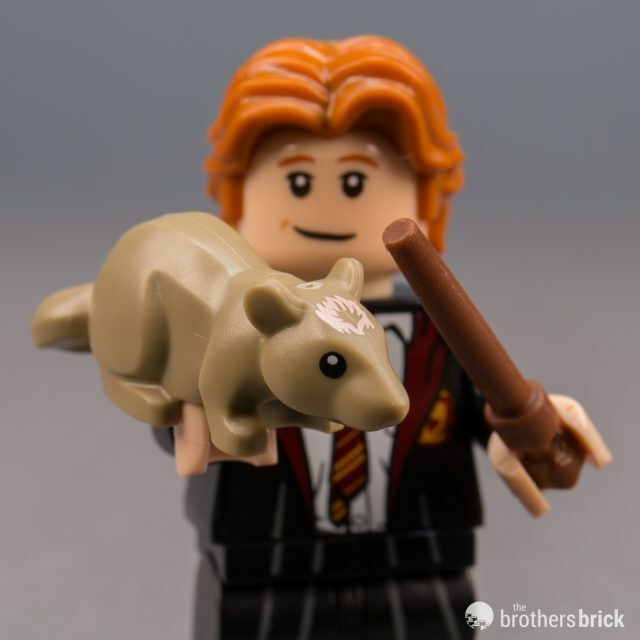 Like Hedwig, Scabbers differs from the version found in Hogwarts Great Hall, having subtly different eyes and an extra bit of fur printed on the forehead. 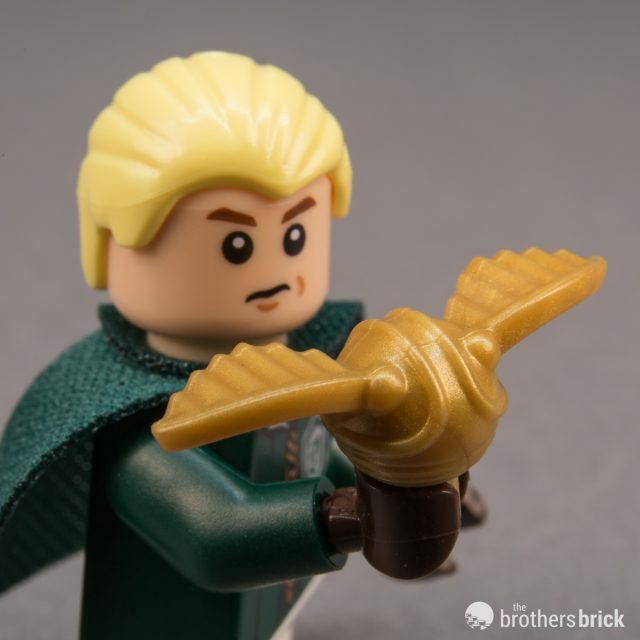 Draco is dressed in the dark green Slytherin team uniform and has slicked back, light yellow hair. Unlike the other students in this CMF line, Draco is a younger version from the students’ novice years at Hogwarts. 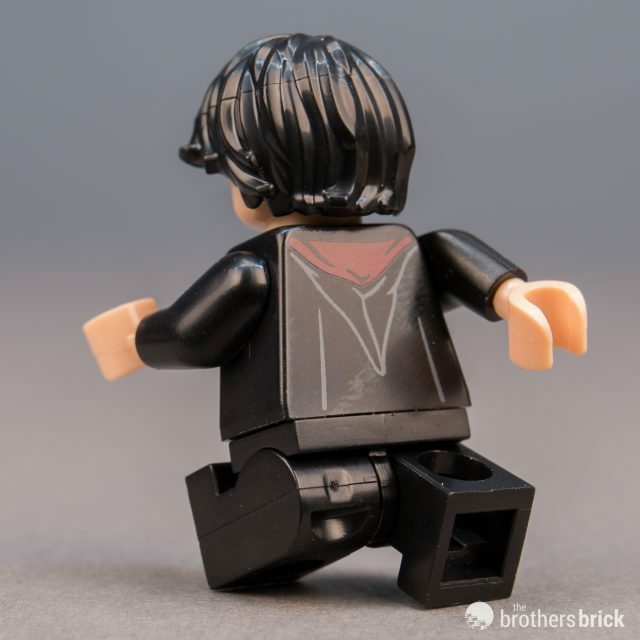 He has short legs to fit in with the other Quidditch players in 75956 Quidditch Match. 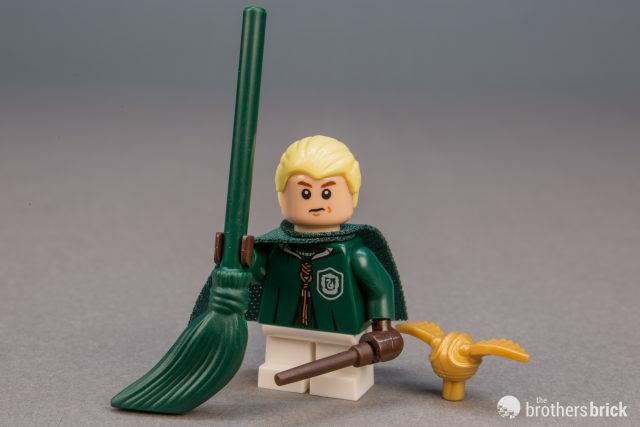 He comes with three accessories: a dark green broom (a new color for that element), a dark brown wand, and a pearl gold snitch. 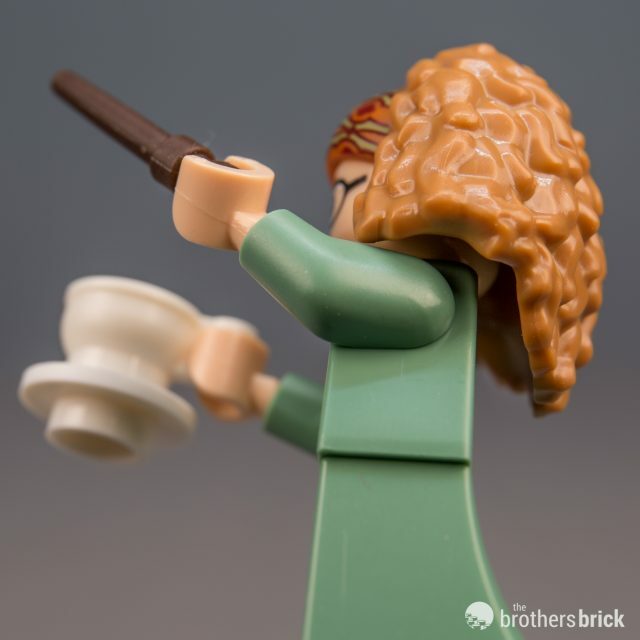 The snitch was introduced in the regular line with the Quidditch Match set, and it’s fantastically detailed for the size. 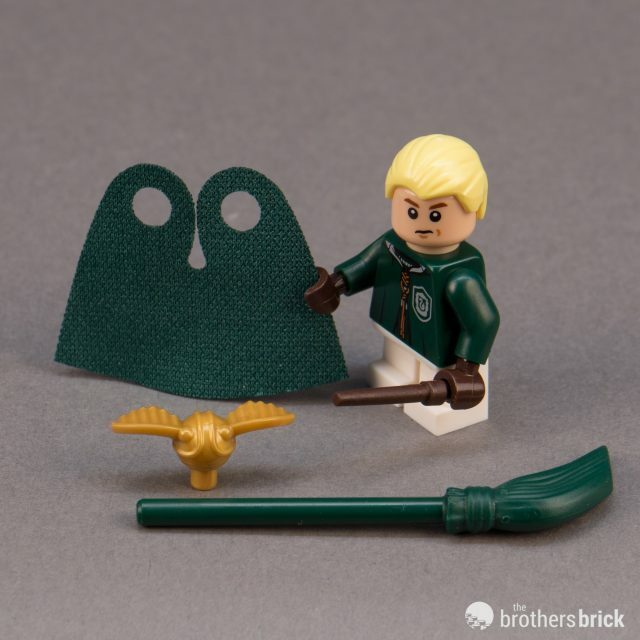 Draco’s short, dark green cape is the less common soft cloth rather than the thin, starched fabric used for most capes. Never one to follow the crowd, Luna is dressed in her usual fanciful colors rather than the drab Hogwarts uniform, with a dark pink torso, blue teen legs, and a cloth skirt printed with horses, hearts, stars, and more. Her light yellow hair is a new mold. The long strands in the back stand out from the torso a little to accommodate the purple satchel strap. 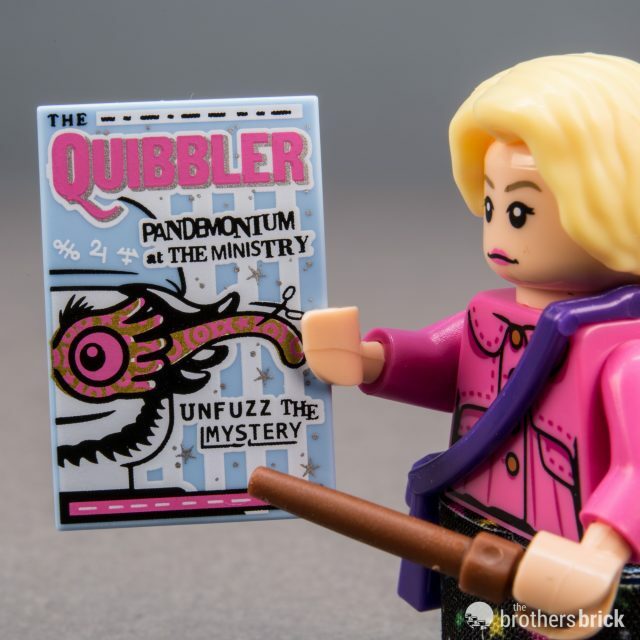 She carries a brown wand and a 2×3 light royal blue tile printed with a wonderfully detailed Quibbler cover. 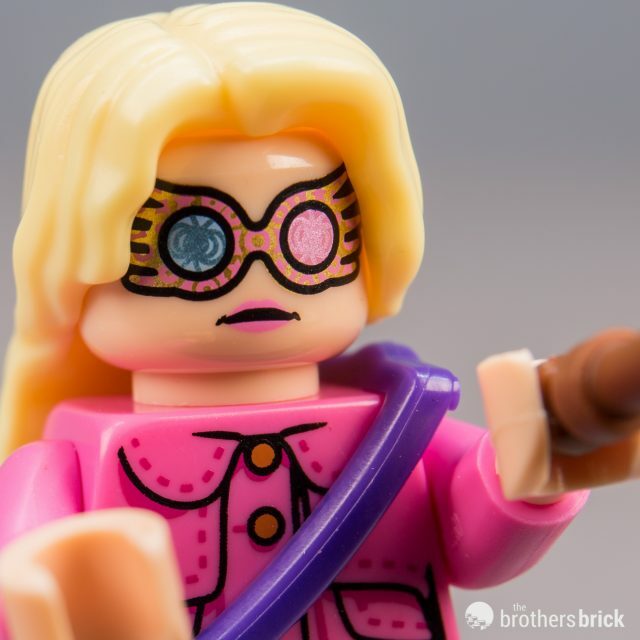 She’s also one of the six characters in this series to feature a double-sided head, wearing her fantastic Spectrespecs on the other side. 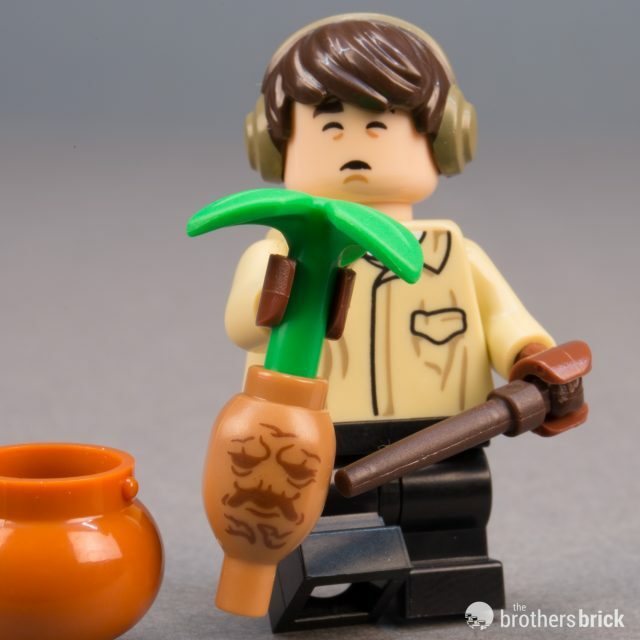 It’s time for Herbology, and Neville is suited up to deal with the dangerous mandrake root, whose screams can incapacitate or even kill an unwary gardener. He’s got dark tan earmuffs, a single-molded element along with the dark brown hair that was first introduced in the Series 8 DJ, though the colors are all-new. 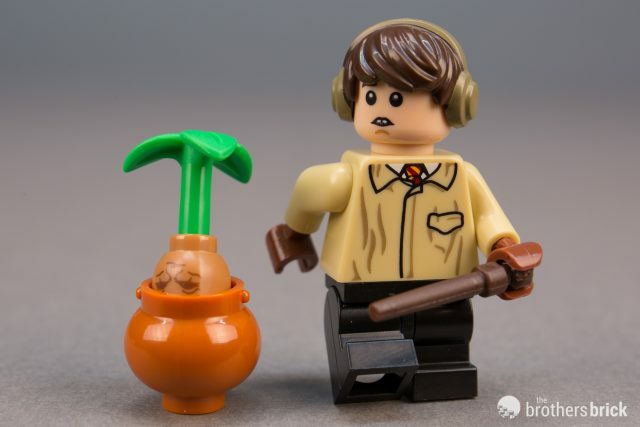 He carries a dark brown wand, but Neville is an unfortunate soul and the mandrake cries knock him out all the same, as shown by the reverse expression on the head. The mandrake sits in a dark orange pot, an is made of two new elements: a dark tan root and a leafy green stem. Both are excellent new elements, with lots of great attachment points. 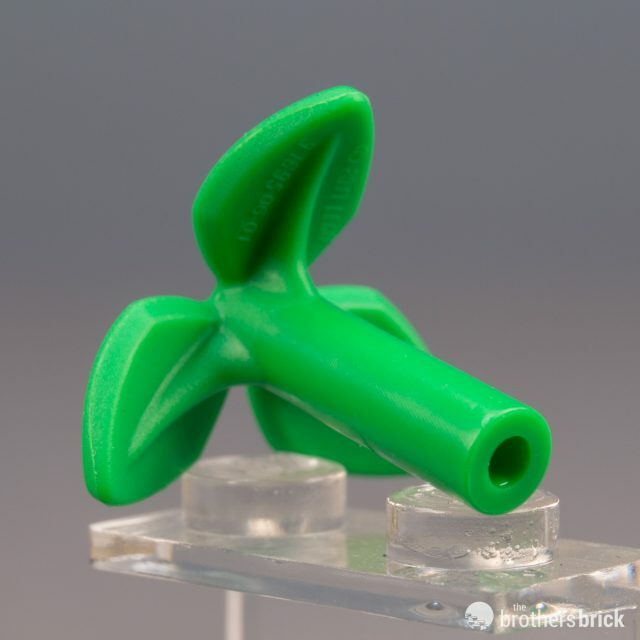 The leafy top has accessory/plume holes in both the top and bottom, and the root has a hollow stud on top and a bottom that, in addition to being a standard 3.18 rod, also has an accessory/plume hole. 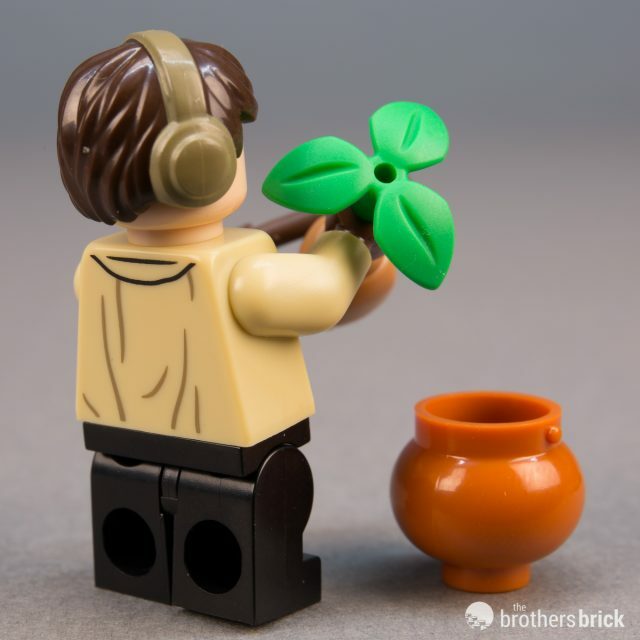 It’s a significant improvement over the previous LEGO mandrake, and the stem is sure to be a hot commodity that we’ll hopefully see in other themes soon. 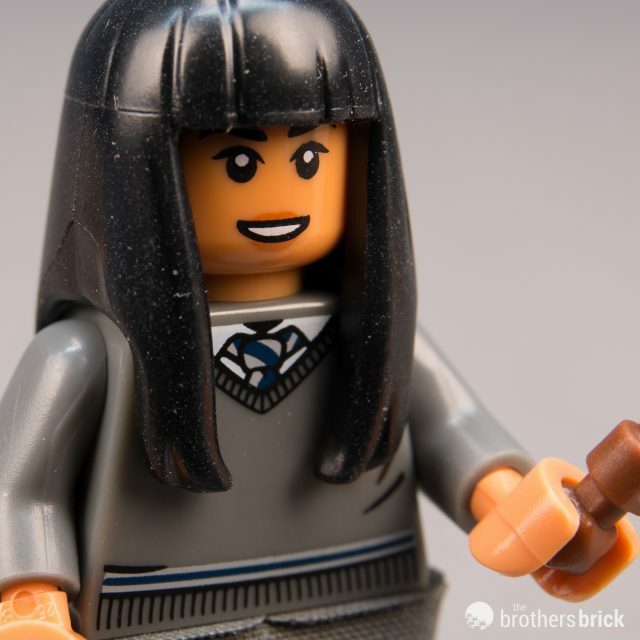 A standout Ravenclaw student, Cho Chang is best known for her brief romantic fling with Harry. 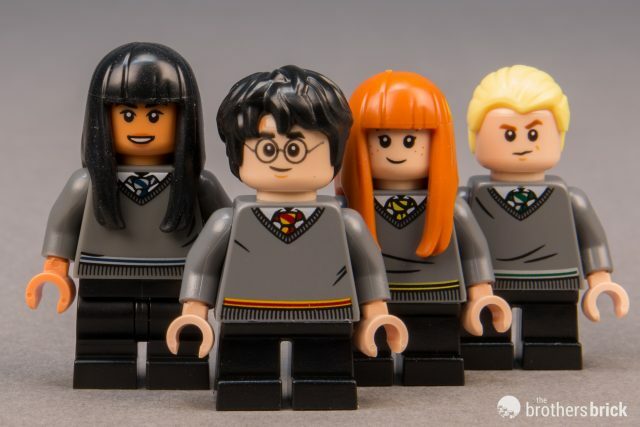 Cho is the only student in the CMF series dressed in the Hogwarts sweater uniform without the outer robes. 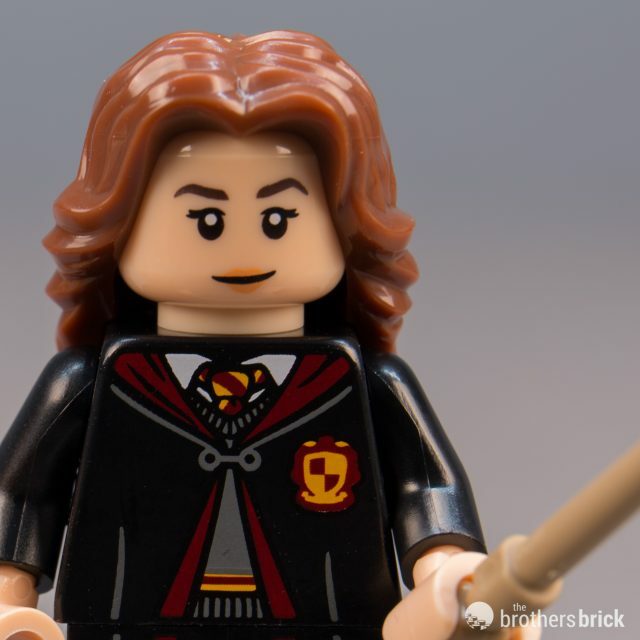 Unlike Hermione from the Hogwarts Great Hall, she has a grey cloth skirt to complete the uniform, with black teen legs beneath. Her long black hair uses the rubber element that first appeared with the Series 12 Spooky Girl. 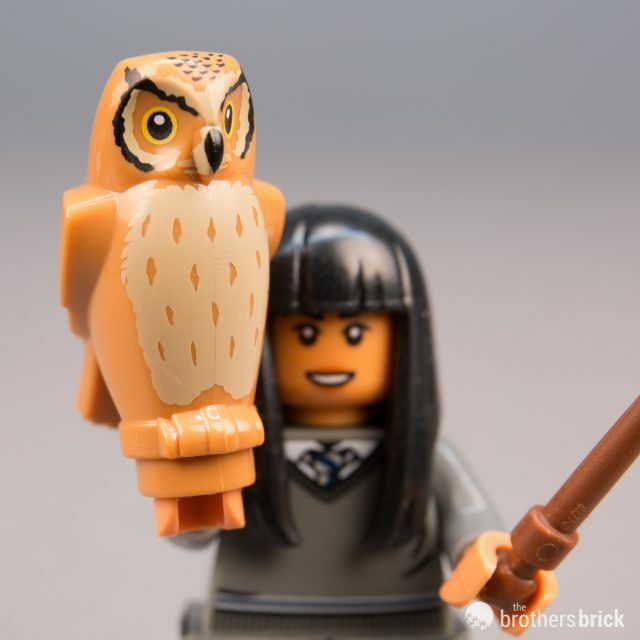 She’s accompanied by an unnamed owl–J.K. 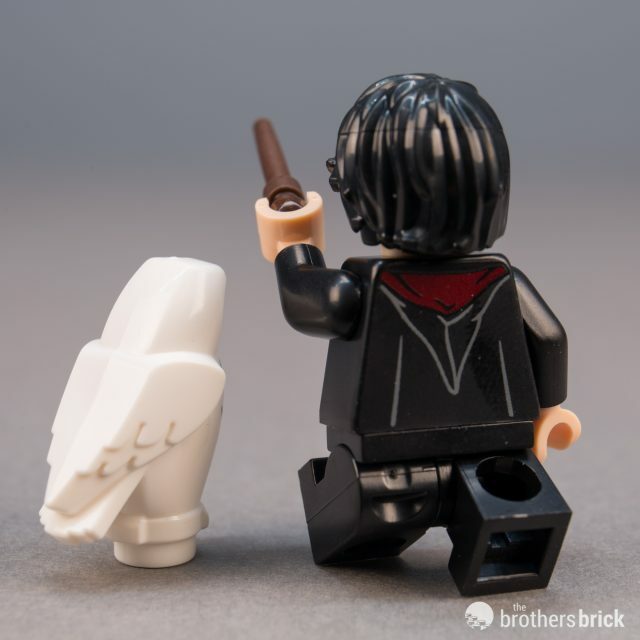 Rowling’s books seem to indicate she didn’t own an owl, though some of the films’ publicity photos depict her with an owl (albeit a much, much smaller one). Cho carries a brown wand. Cho’s Ravenclaw sweater completes the set of the four houses, with Gryffindor, Hufflepuff, and Slytherin all coming in the Hogwarts Great Hall set. 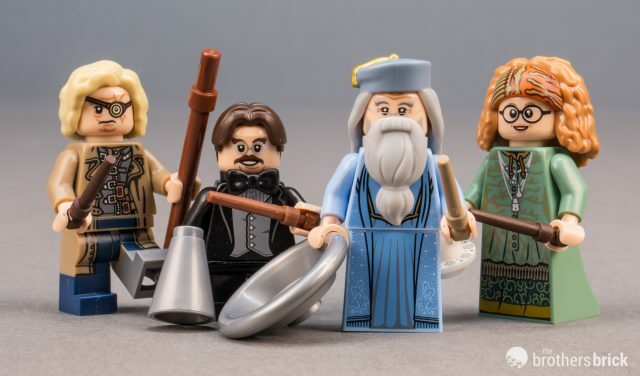 LEGO appears to be making a conscious effort with the rebooted Harry Potter theme to fill in the gaps that were present in the previous lines, and it’s a welcome effort. 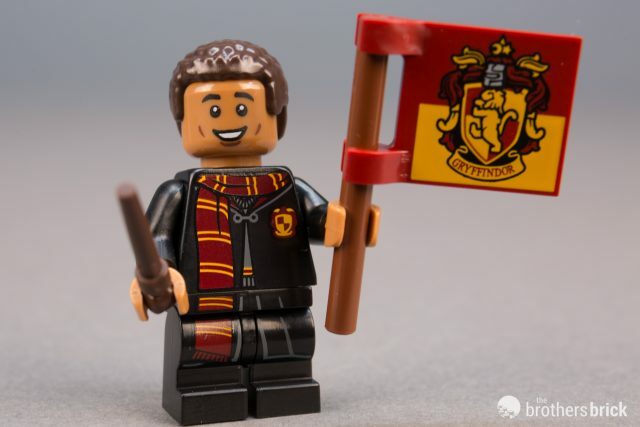 One of the lesser-known characters in the CMF series, Dean is a Gryffindor student in the same year as Harry, who makes regular appearances throughout the books and films. Here he’s dressed to the nines in his Hogwarts uniform, boasting the neatest robes of any of the students and sporting a long scarf. 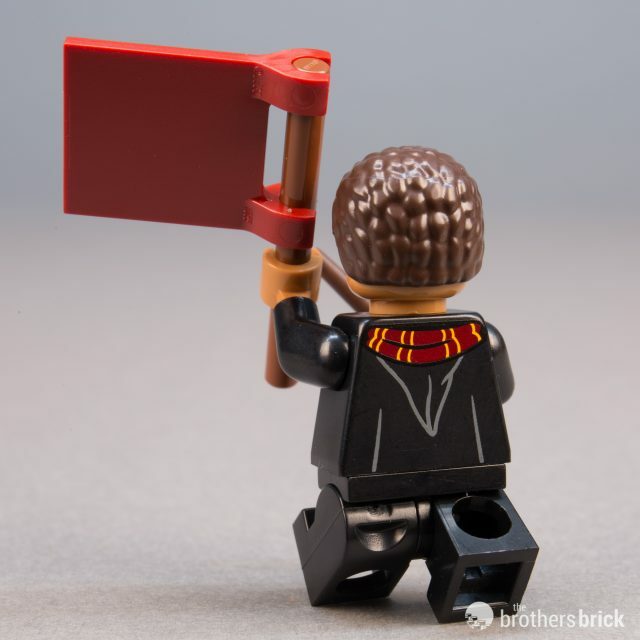 Presumably, he’s dressed up to cheer Gryffindor at a match, since he’s carrying a pennant (which is sadly single-sided), although Dean wasn’t originally a fan of the sport, preferring the muggle sport of football. He carries a dark brown wand. Between the four students in Hogwarts robes, there’s a nice variation of tidiness, from Dean’s formal attire to Ron’s rumpled, just-woke-up look. 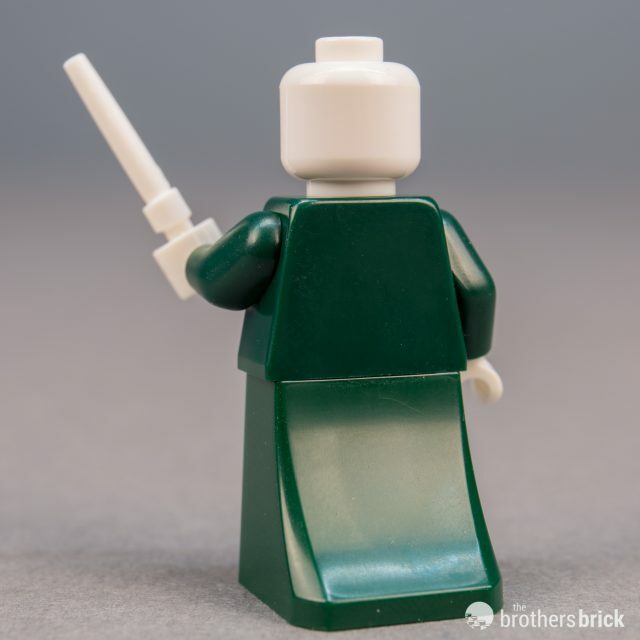 He Who Must Not Be Named stands tall and pale in dark green robes, wielding a white wand–the only way thus far to get that color wand, either in this series or the regular theme. 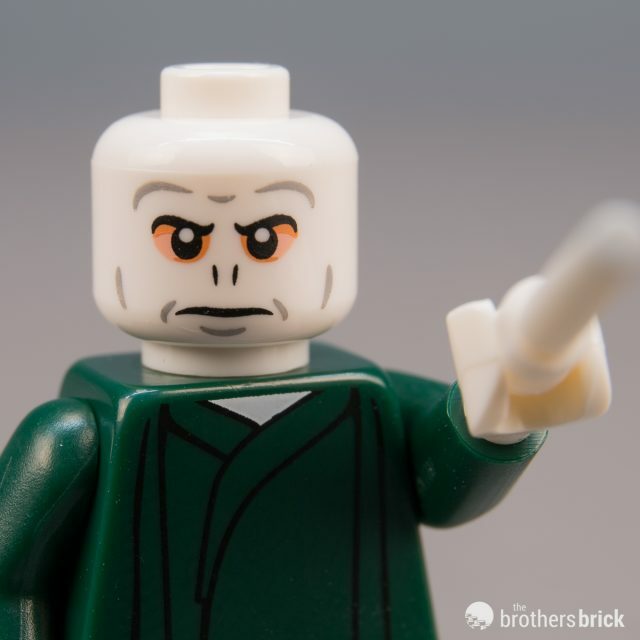 Voldemort has a more neutral expression than the previous LEGO versions, which depicted him variously scowling or leering. His long robes utilize the new dress element, which is printed on the front only. He’s accompanied by Nagini. 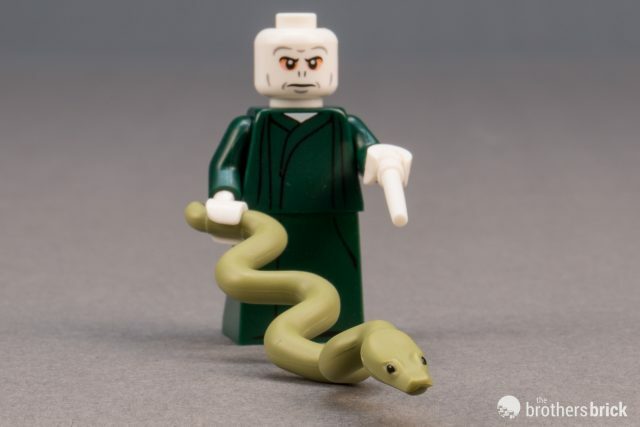 Voldemort’s companion, the giant snake Nagini, is a new element that’s frighteningly more realistic than any previous LEGO snakes. 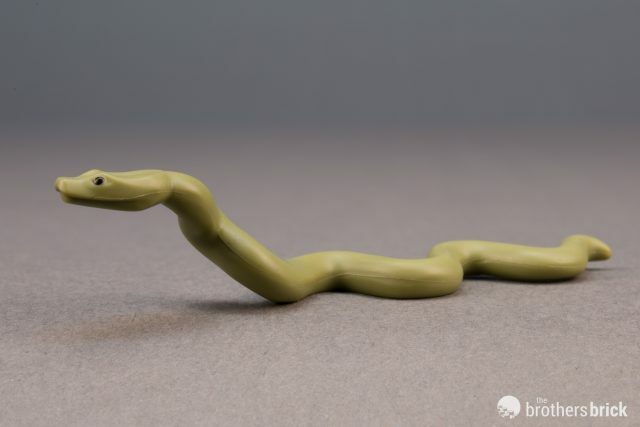 The olive green snake is made of a semi-hard plastic similar to the wands, but is frustratingly almost entirely out of System in dimensions. 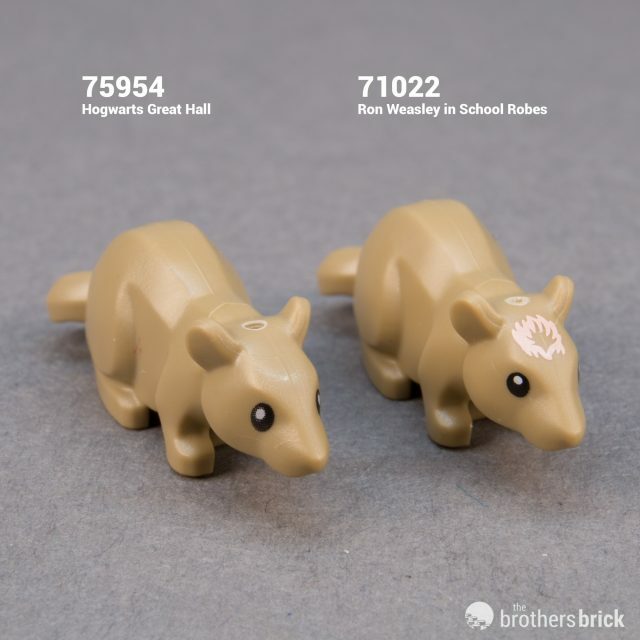 It’s eight studs long and there’s a small segment near the tail that a minifigure hand can grasp, but apart from that is devoid of other obvious connections. 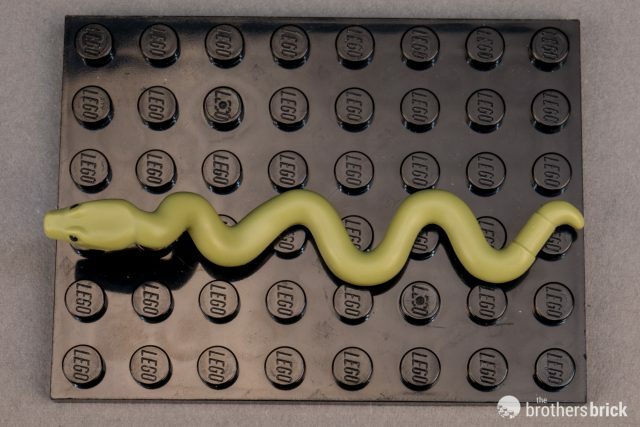 At first, I thought the snake’s squiggled body would fit around studs, but they do not appear to align at all. 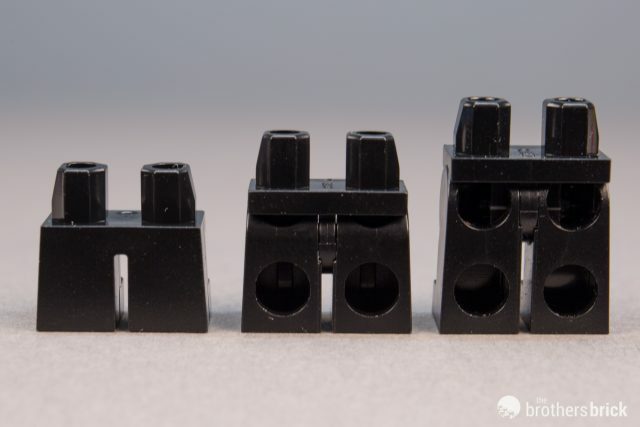 While we prize accuracy in our LEGO models, it’s disappointing when that accuracy comes at the expense of LEGO’s primary mission: interlocking elements that are part of a unifying System. 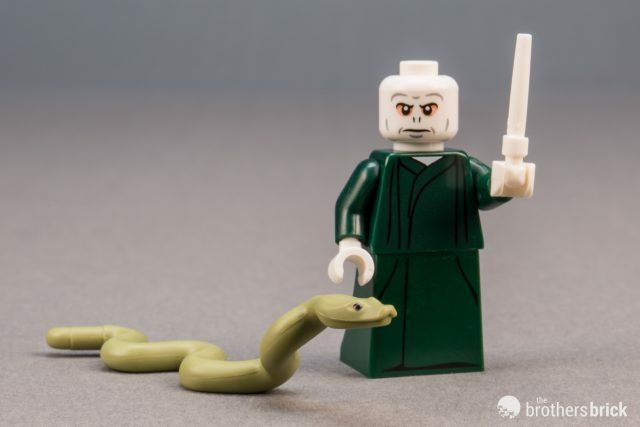 Nagini is a great looking snake, but a poor LEGO element. Dobby the house elf, friend of Harry, Ron, and Hermione, is a bedraggled character with a good heart. Outfitted with nothing but rags, he carries Tom Riddle’s Diary, secretly containing the key to his freedom: a sock. 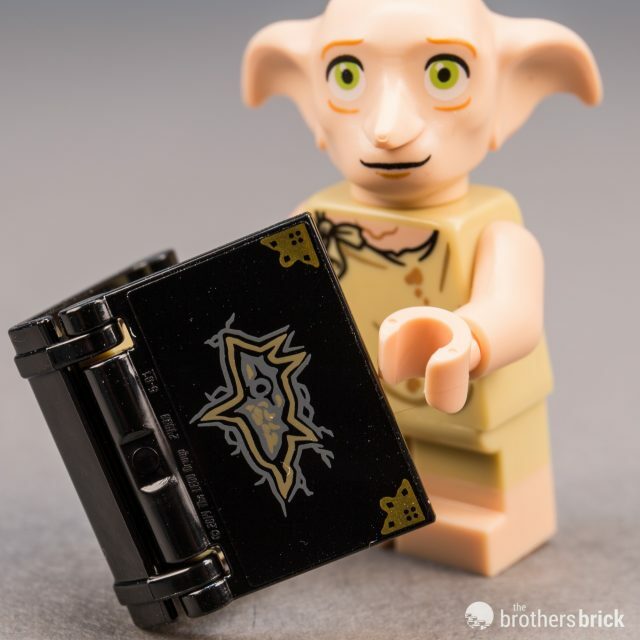 The black book is printed on the cover, and the sock is a printed 1×2 tile, as it has been since LEGO Dobby was first freed in 2002. Like his sock, Dobby is now on his third iteration, though this is the first time he’s received a new head mold. 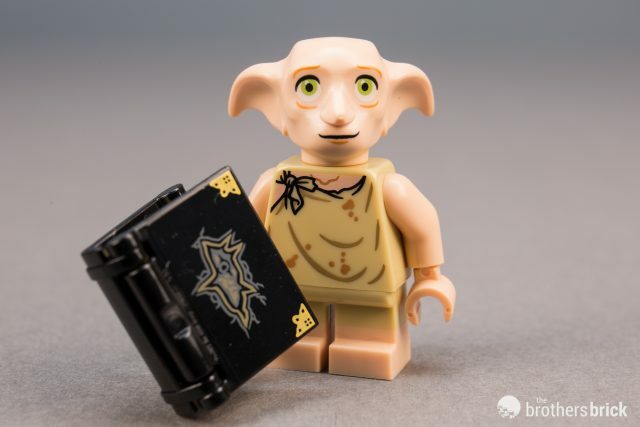 The original head design was quite good, and while this new design makes Dobby appear a bit more friendly, the original was probably a little closer to the on-screen character. 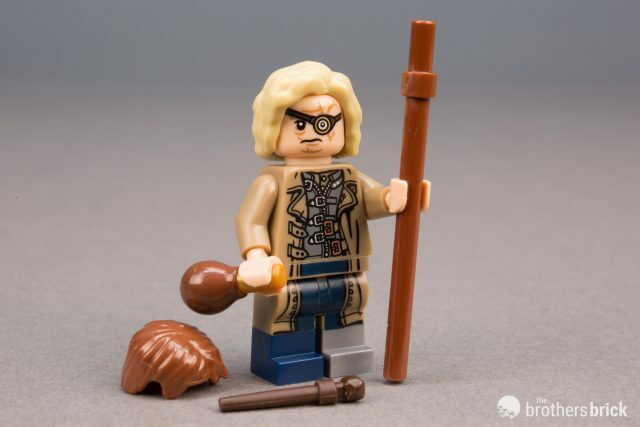 Professor of Divination Sybill Trelawny is a figure likely absent from most fans’ collections. 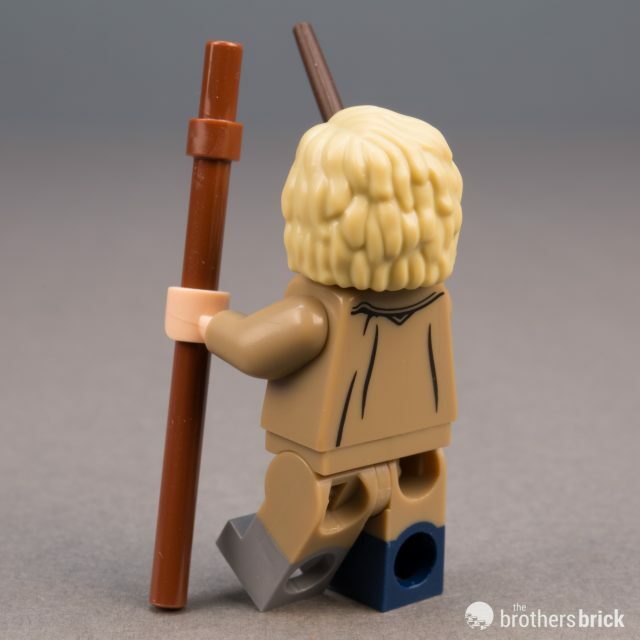 She has only appeared once before in LEGO form, way back in 2004. 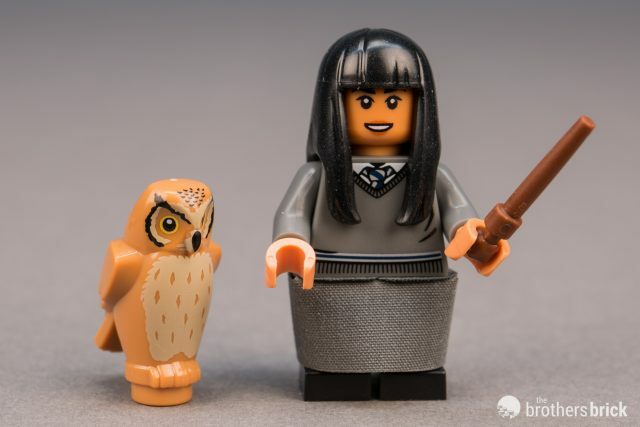 That minifigure is currently selling for an average of $52 used or $83 new, so this character is a very welcome addition for fans attempting to put together the Hogwarts staff. With a sand-green dress courtesy of the new dress slope, she has a variety of silver trinkets printed on chains about her neck. Her famously wild hair could only be captured with a new element, dual molded in medium dark flesh for the hair and dark orange for the headband. Like Luna’s hair, it stands off the torso enough to accommodate some accessories, though it doesn’t serve that function here. 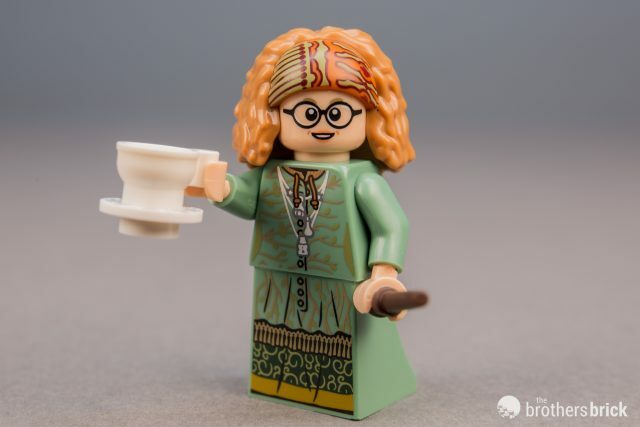 And while Professor Trelawney may be a bit high-strung, but she does love her tea. Along with her dark brown wand, she carries a teacup and saucer, which are each new elements. 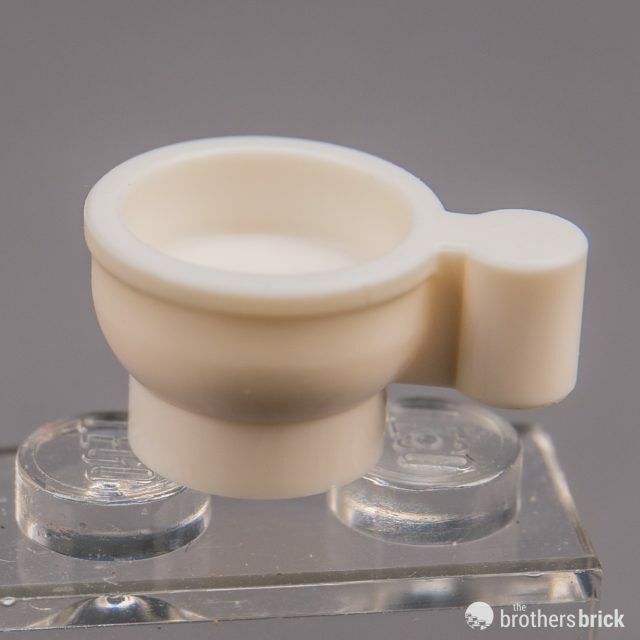 The saucer is slightly wider than a minifigure head, and is essentially a 1×1 round plate with a wider lip. The cup has an accessory/plume hole on the bottom of the handle. 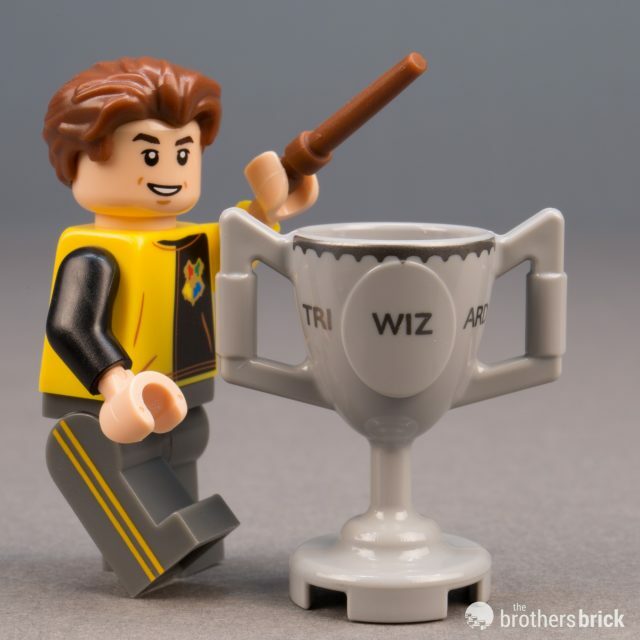 Captain of Hufflepuff’s Quidditch team, Cedric is older than the leading cast of Hogwarts students, and so gets full-height minifigure legs. 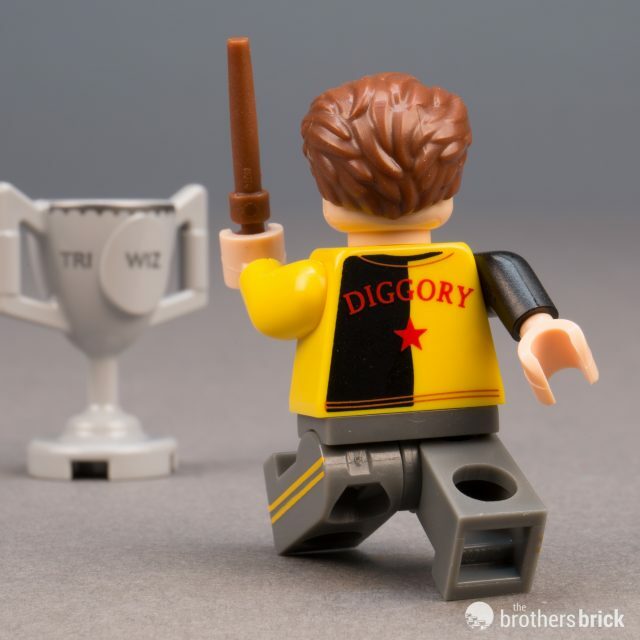 He’s dressed in the yellow and black Hufflepuff uniform for the Triwizard Tournament, with yellow stripes down his trouser legs and Diggory emblazoned across his back. His hair is the suave style that first appeared in the Series 16 Dog Show Winner, new in brown. 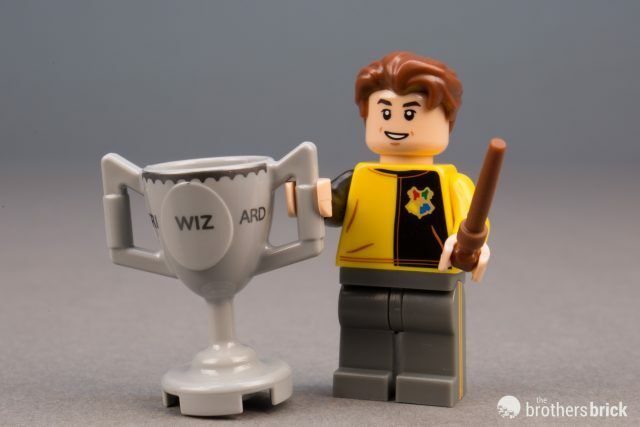 He holds a brown wand and the light grey Triwizard Cup, LEGO’s large trophy element first introduced in 2010. It doesn’t look quite as ludicrously oversized as usual, though it only vaguely resembles the film cup. 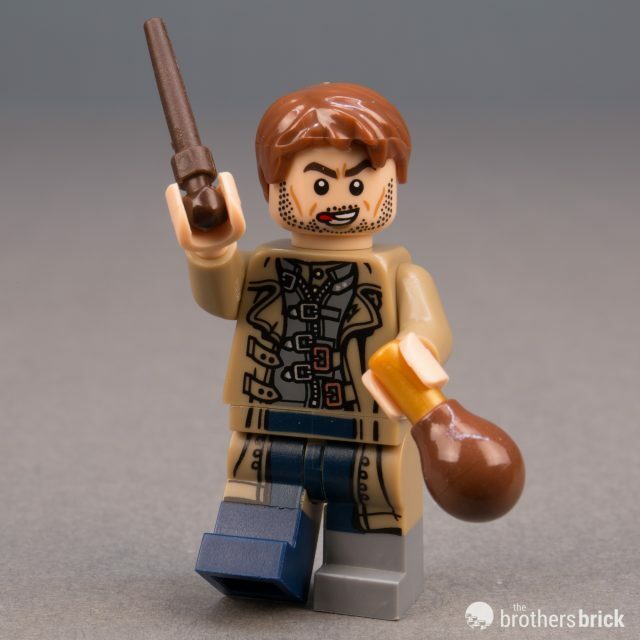 Despite playing a fairly integral role in the series, especially in Goblet of Fire, this is the first time Cedric appears in minifigure form. 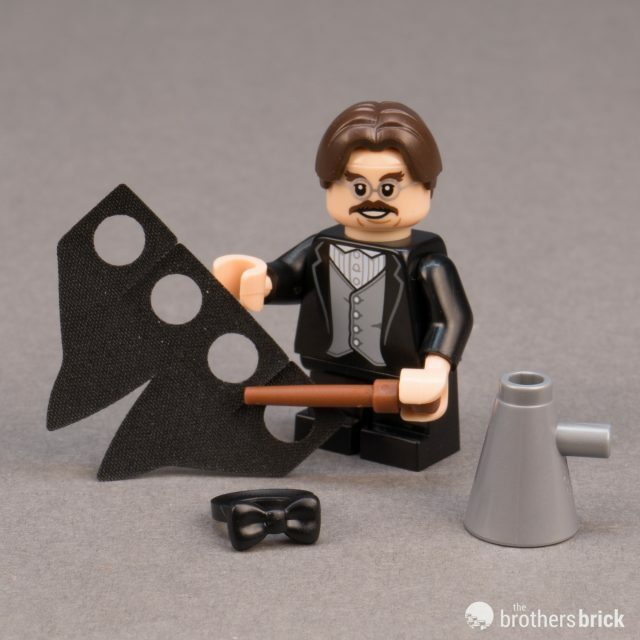 The diminutive Charms Master at Hogwarts, Filius Flitwick looks dashing in his three-piece suit and black bowtie. 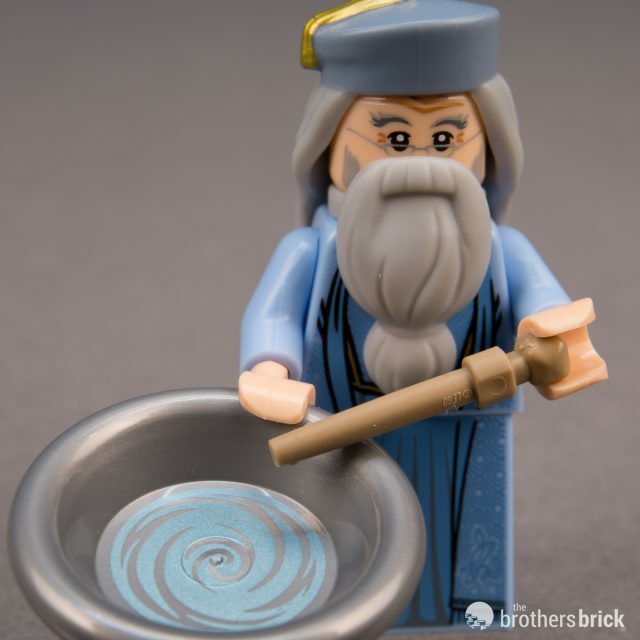 This is the second LEGO version of the part-goblin Ravenclaw House Head, and he looks considerably more like his on-screen counterpart than the previous one. His black coat extends below the waist thanks to a cloth element giving him long coattails. He’s got short legs, shorter even than the coattails, and the starchy cloth on the tails actually threatens to flip him over face first, until I creased the tails where they meet the ground. 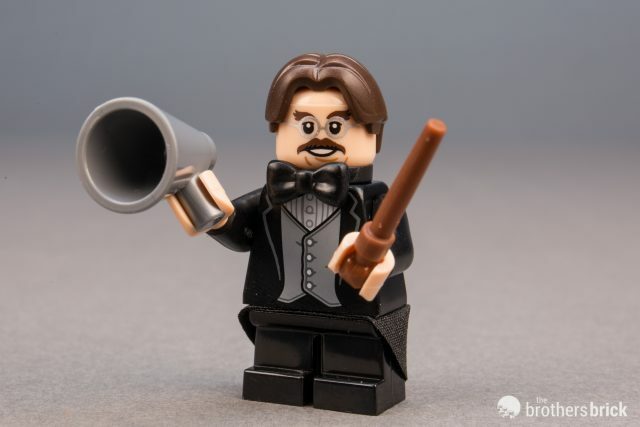 Flitwick’s center-parted dark brown hair is a new element, and he carries a brown wand and another brand new element, a bullhorn. 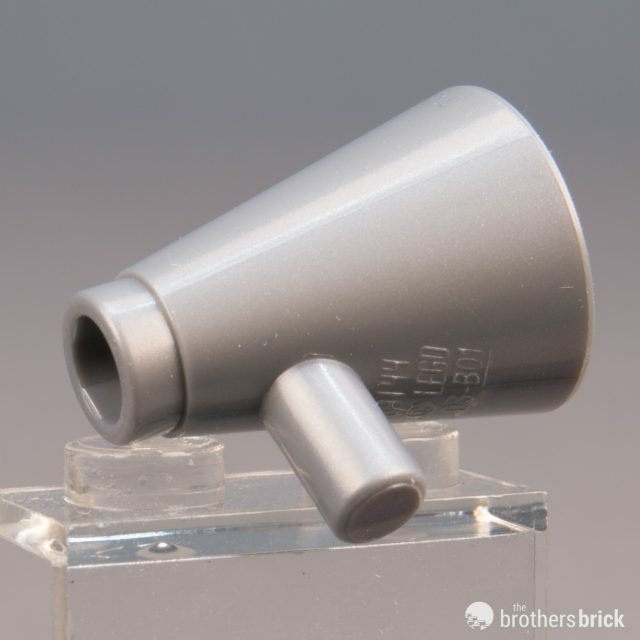 The bullhorn is open all the way through, with a wide end slightly larger around than a minifigure’s head and the narrow end being a hollow stud. 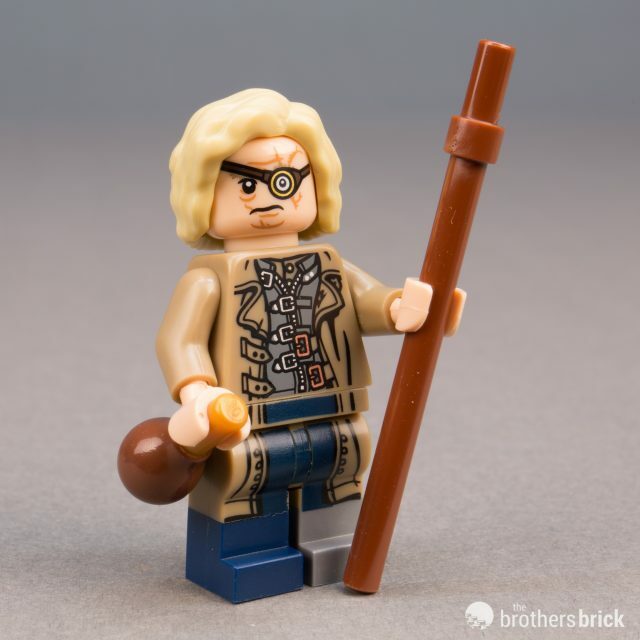 The curmudgeonly Defense Against the Dark Arts teacher Alastor “Mad-Eye” Moody has had his share of run-ins with nefarious forces, having lost both his leg and eye in the process. Now he walks with a pronounced limp and relies on a walking staff, played here by a brown bar 6L, and carries a dark brown wand. 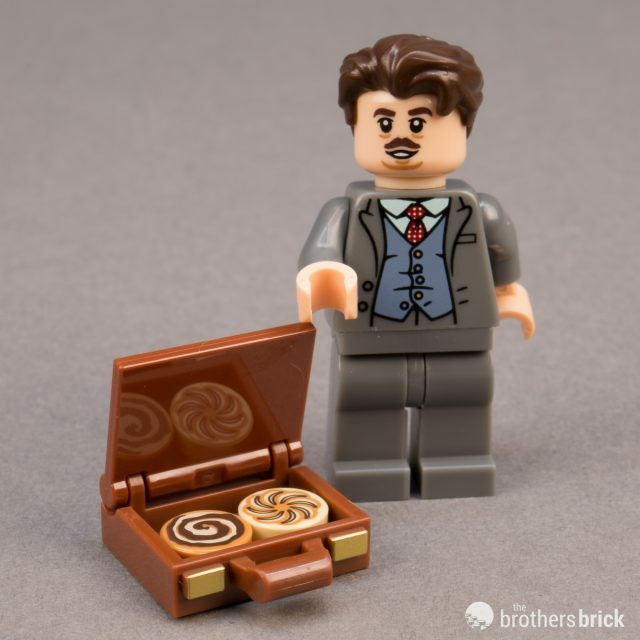 His dark tan overcoat is detailed with lots of clasps and buckles, and the legs are dual molded–dark tan on top for the long coat, paired with dark blue for the good leg and flat silver for the replacement. But not all is as it seems! After being kidnapped by Barty Crouch Jr. in Goblet of Fire, he’s impersonated by Barty thanks to a polyjuice potion. Both the potion and Barty are included here–Barty on the back of Mad-Eye’s head with a quick change of hair, and the potion in a flask. 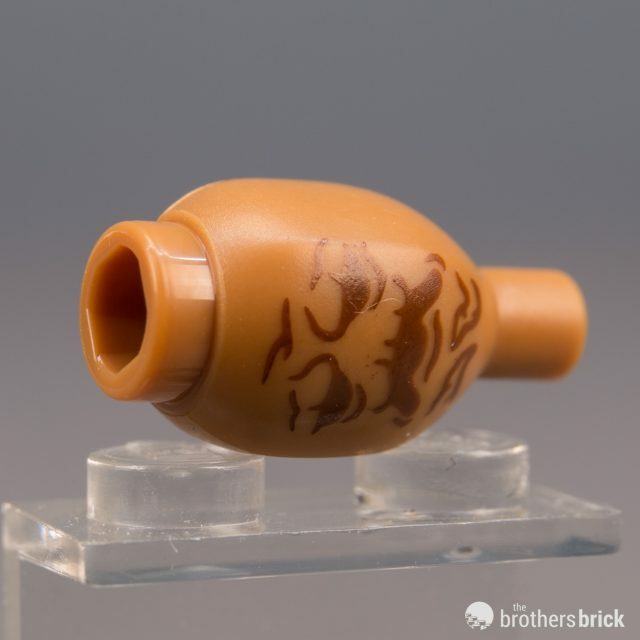 The flask is a maraca that’s dual-molded for the first time, giving it a brown base and pearl gold neck. 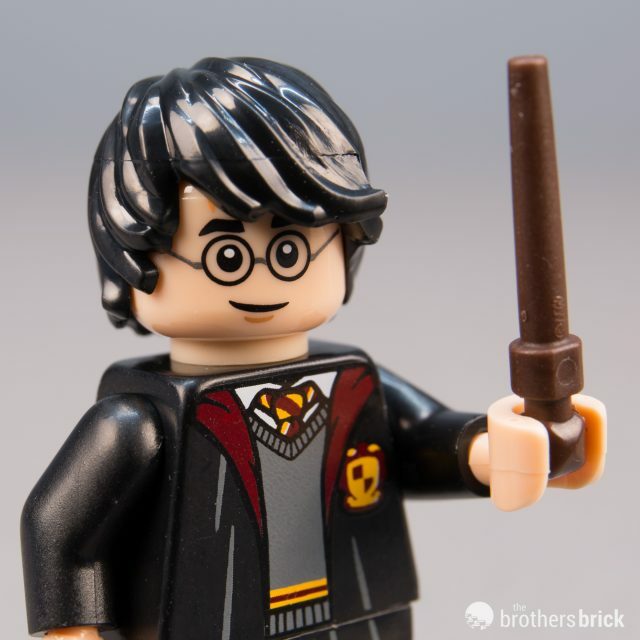 No surprise for lending his name to the franchise, Harry is the only character in this series to appear twice. 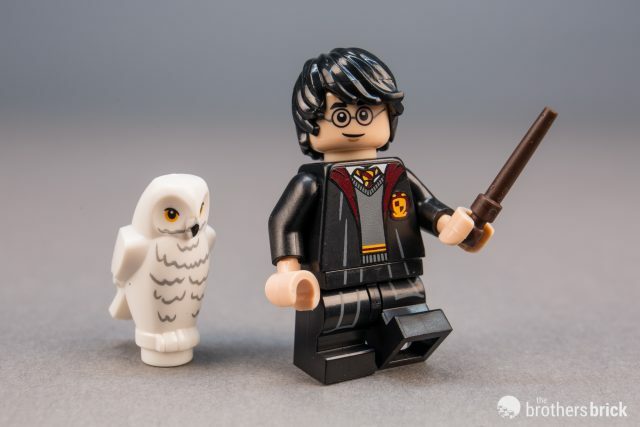 Along with Draco Malfoy, this version of Harry is set in the first years at Hogwarts like the regular Wizarding World sets available currently, so Harry has short legs. He’s dressed in his pajamas for a nighttime excursion with his cloak of invisibility. 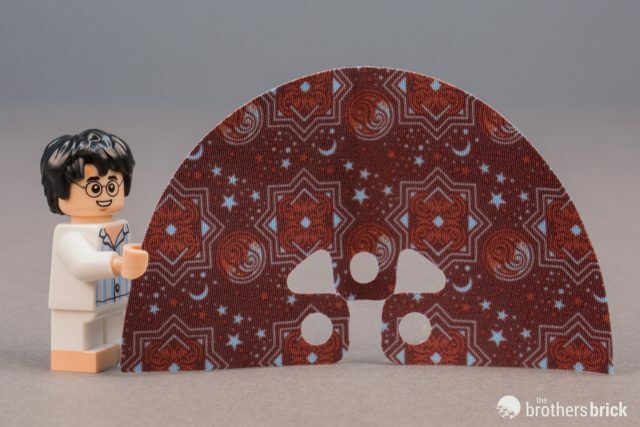 Harry’s pajamas are white with blue stripes, and he’s got bare feet thanks to a bit of flesh-colored printing around the legs. 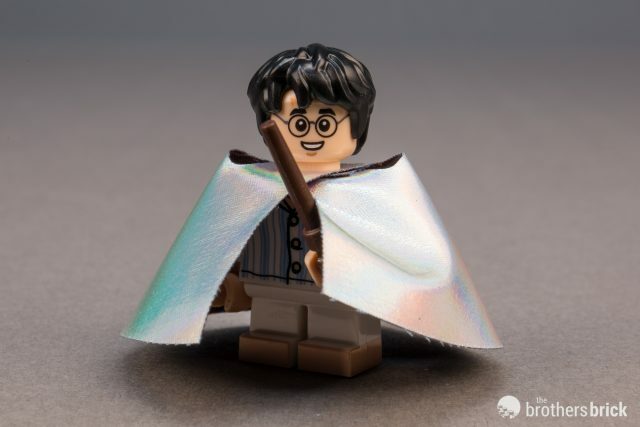 The cloak is a massive piece of fabric that wraps all the way around Harry, leaving only his head exposed. It’s opalescent on the outside simulating the invisibility, and has a lovely dark reddish brown and blue pattern on the inside. Harry carries his signature dark brown wand. 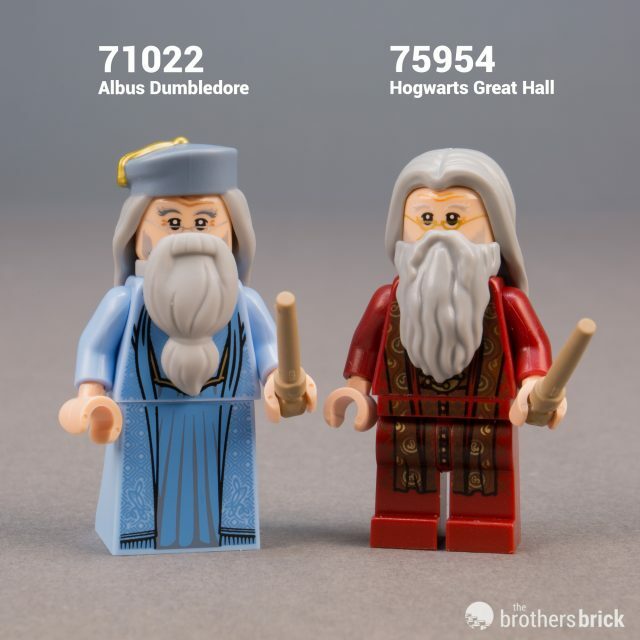 The venerable Hogwarts Headmaster Albus Dumbledore has had numerous iterations through the LEGO Harry Potter theme, but none have captured the kindly old wizard so well as this one. 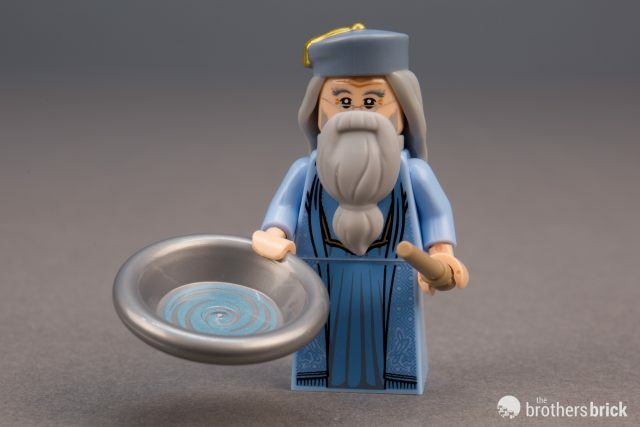 Based on Michael Gambon’s portrayal from Prisoner of Azkaban on, rather than Richard Harris’ version seen in the Hogwarts Great Hall set, this version features Dumbledore’s pale blue robes, with the new dress element making the flowing robe bottom. 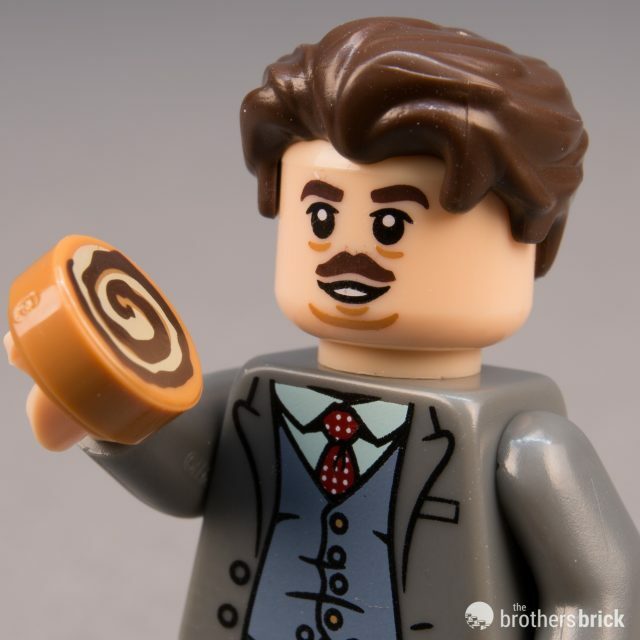 Both the hair and beard are new elements, though the beard is similar to Vitruvious’ from The LEGO Movie. 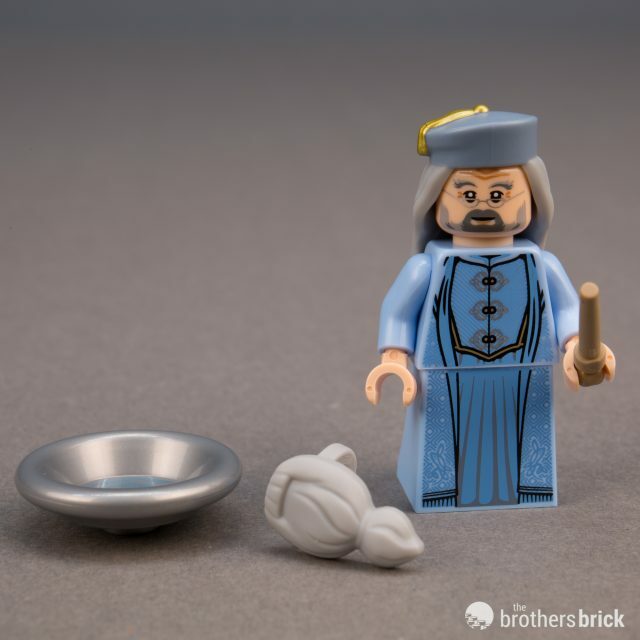 The hair is double-molded to include Dumbledore’s cap with a gold tassel. 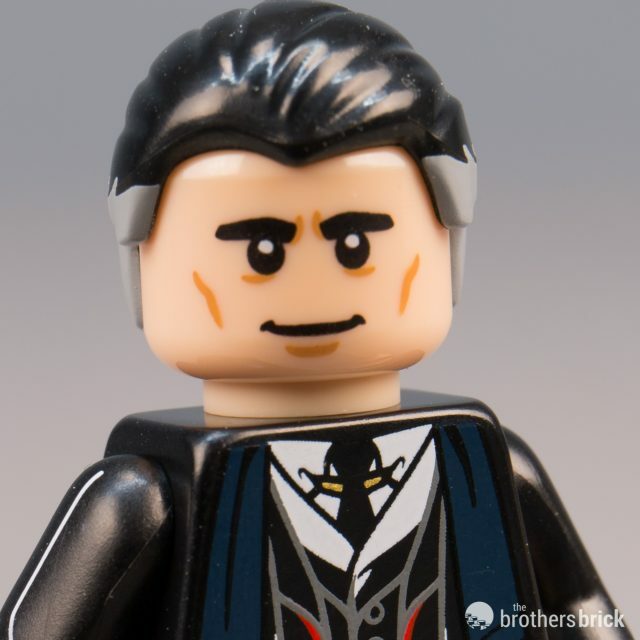 Beneath the beard, as always, the full minifigure face is printed, though of course without the long beard it doesn’t look much like the Headmaster. 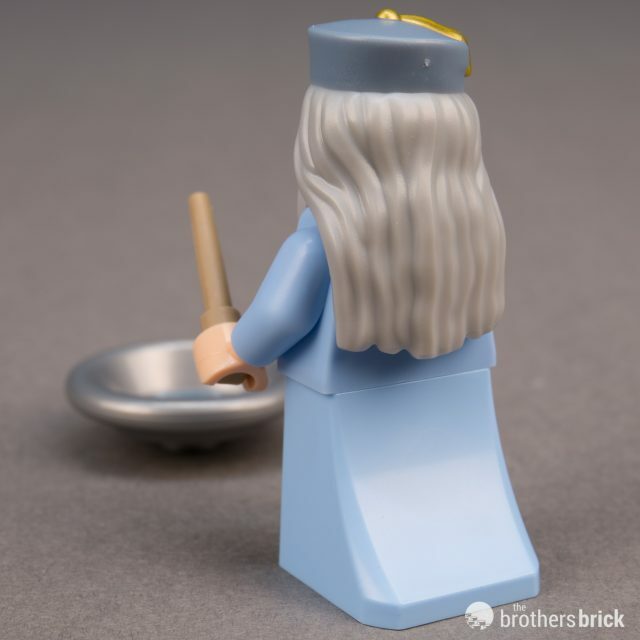 Dumbledore carries a dark tan wand and the Pensieve to retrieve memories. The Pensieve is the standard LEGO dish in flat silver, with a metallic blue swirl pattern in the bowl’s center. The remaining six characters hail from Fantastic Beasts and Where to Find Them. 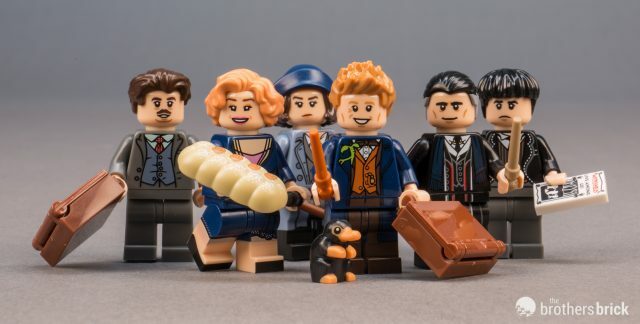 All six seem to be based on the first film, so with the second film hitting theaters later this year, it should come as no surprise if (when) LEGO announces a second series based on The Crimes of Grindelwald. As the author of Fantastic Beasts and Where to Find Them, Newt is a world-renowned Magizoologist, AKA expert in magical creatures. As with the other five characters from this side of the Wizarding World, Newt is based on the first film’s depiction, dressed in a dark blue overcoat that extends onto the leg via dual-molding in dark blue and dark brown, and he has an adorable lime green Bowtruckle on his collar. 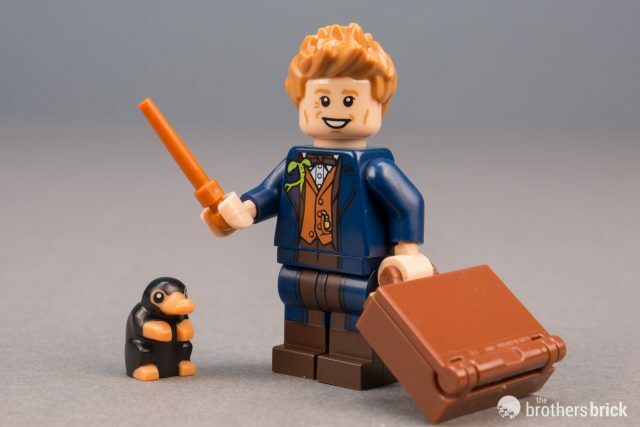 This is the second LEGO version of Newt Scamander, following an appearance in LEGO Dimensions, but the hair is the only commonality. 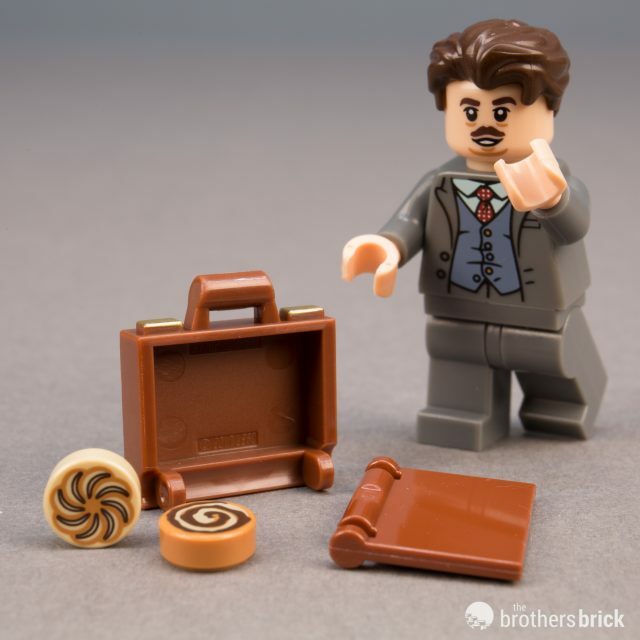 He’s carrying the wondrous briefcase that houses his magical menagerie, which is made of two elements: a new element for the base, and a lid made with the existing book cover element. 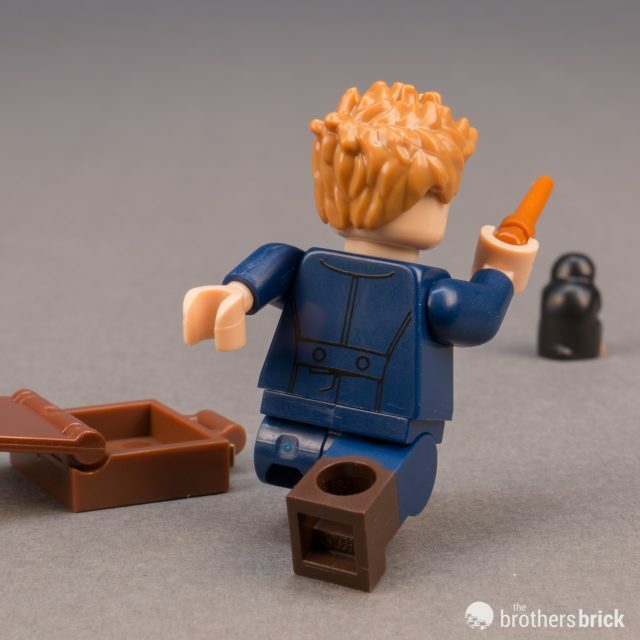 Newt carries a dark orange wand, and will be constantly in a state of hurry, as the Niffler has escaped and is also running about. 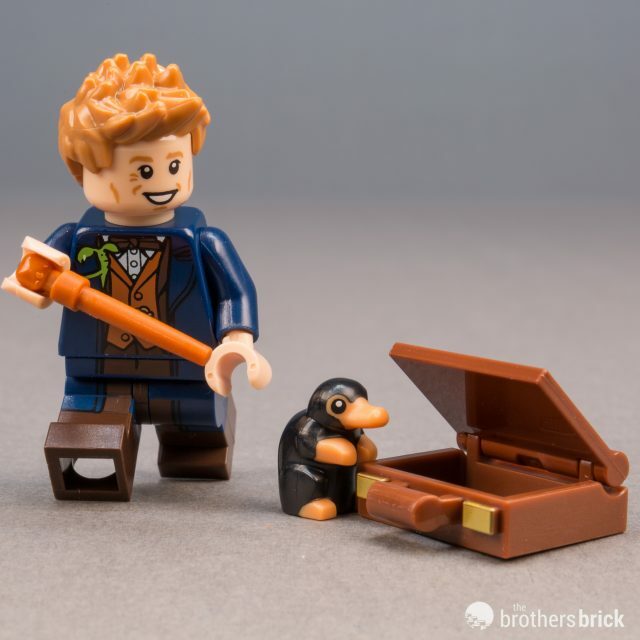 The Niffler is an adorable little creature that’s remarkably close to an accurate scale, unlike most small LEGO animals. 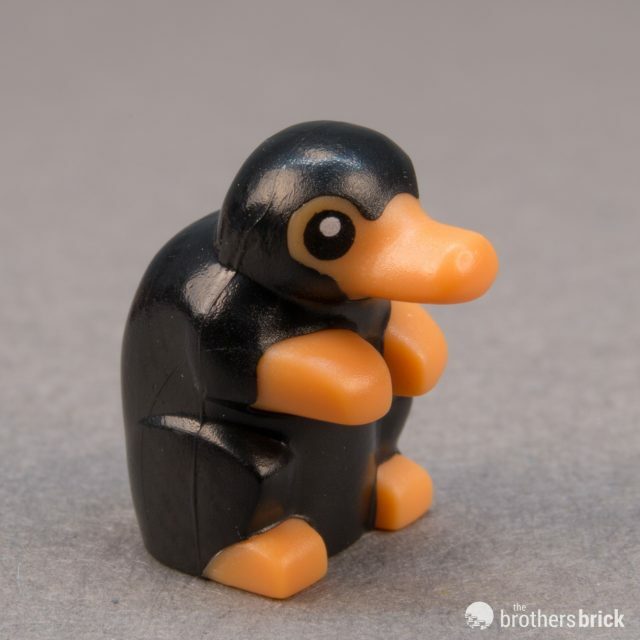 The Niffler sits on a single stud, and is dual-molded in black and medium dark flesh, with printed eyes. An American magician, Porpentina Goldstein is an Auror and friend of Newt’s. 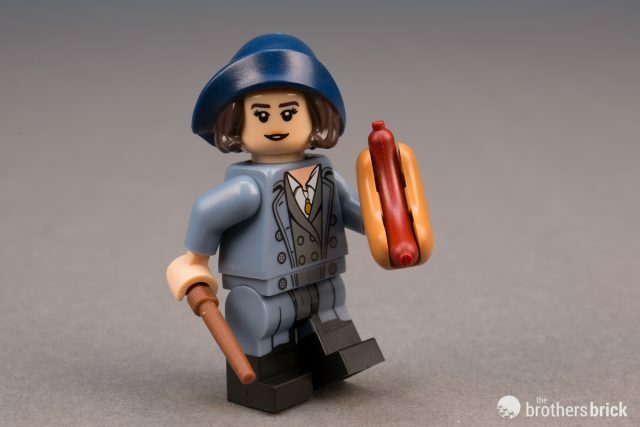 Tina carries a classic hot dog, as she did briefly in the film. Like Newt, Tina also appeared in Dimensions with a remarkably similar design, though that version was light grey with a dark grey hat. Here, she’s outfitted with a lovely sand blue dress coat and dark blue hat befitting 1920s New York, and her legs are dual-molded. 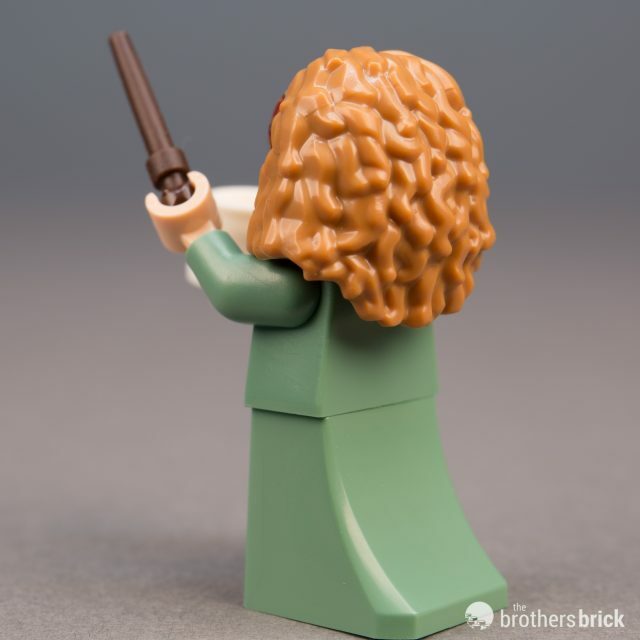 Her hat and hair are a single element, reused from the Dimensions version, and she carries a brown wand. Reversing Tina’s head offers an alternate expression of disapproval. 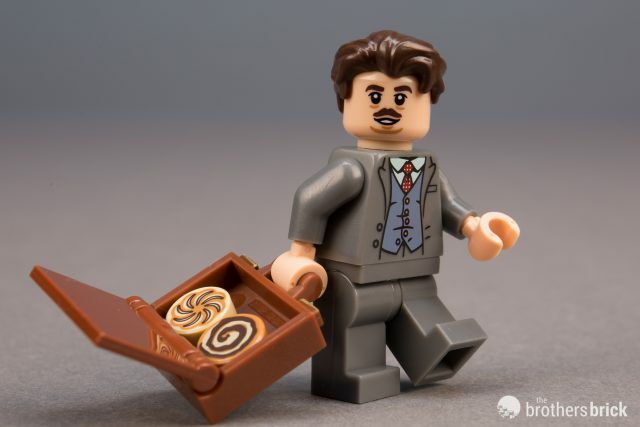 The portly entrepreneurial baker Jacob Kowalski makes his first LEGO appearance here, toting an identical piece of luggage as Newt Scamander, only Jacob’s is filled with pastries rather than mischievous magical creatures. 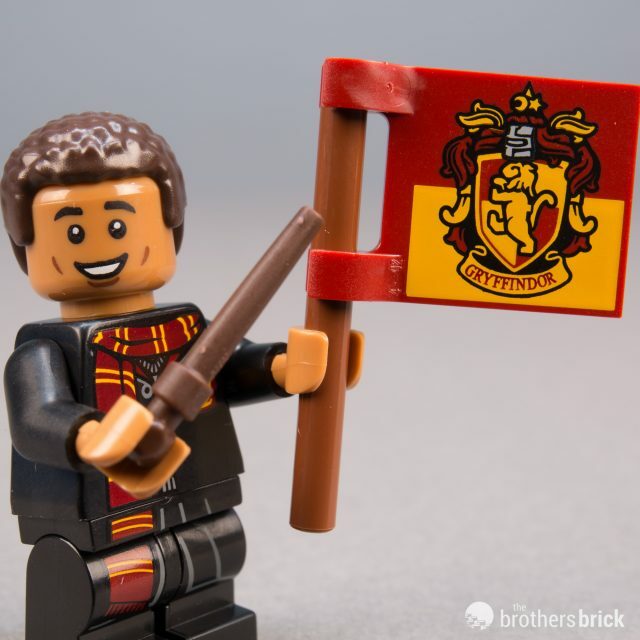 Jacob has a handsome dark grey suit and the same bushy hair as Cedric Diggory, though in dark brown, the same worn by the Series 18 Red Brick Suit Guy. His pastries are made of printed 1×1 round tiles, both new designs that will fit perfectly with the existing pastry tiles. Along with her sister Tina, Queenie is a magician residing in New York who befriends Newt. 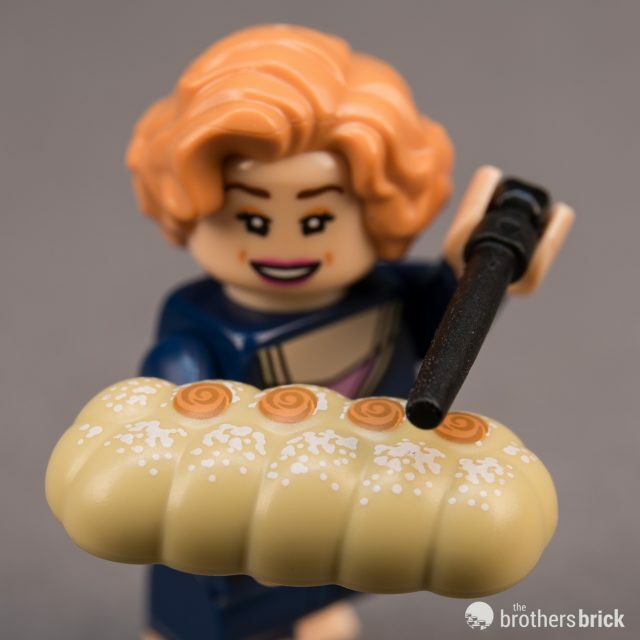 Much more disposed to openly use magic than her sister, Queenie also has a soft spot for Jacob’s baking, so it’s no surprise she comes with an apple strudel, a brand new element to add to the variety of LEGO food at your next brick banquet. The bread is hollow underneath, with a single central anti-stud that’s flush with the pastry’s bottom edges. 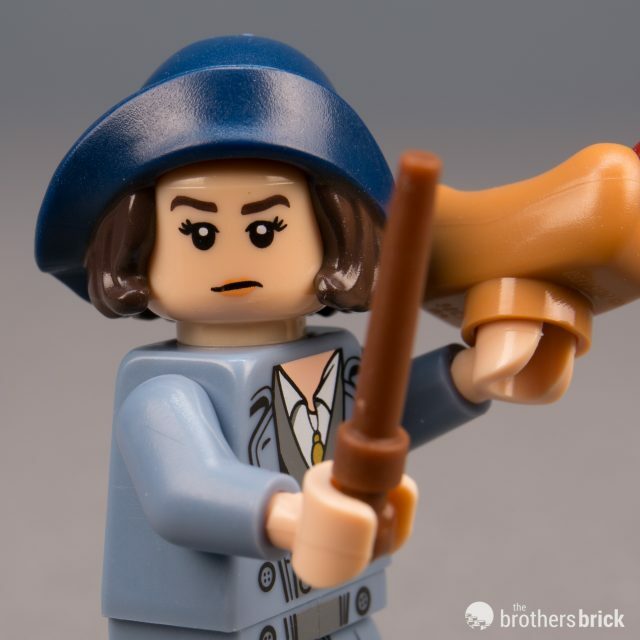 Her dark blue dress extends halfway down the dual-molded legs, and she has black heels printed on–or as near as a minifigure can get to heels. Queenie’s medium dark flesh hair is new in that color, having first appeared back in Series 9’s Hollywood Starlet. She wields a black wand, sadly without the decoration her real wand has. 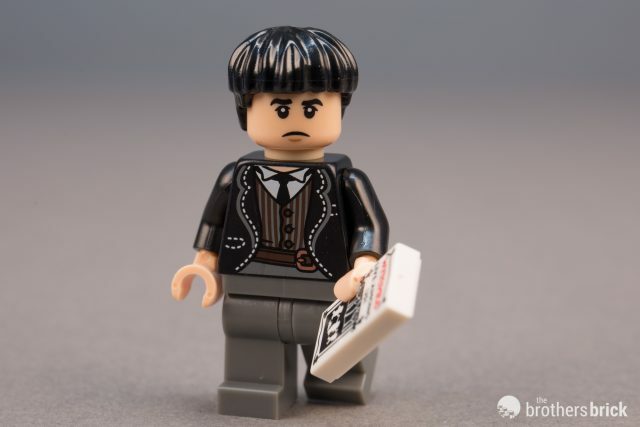 A central figure in the first Fantastic Beasts film, Credence is a distraught young man with an uncanny ability for magic. Raised in the thrawl of the No-Maj group New Salem Philanthropic Society, Credence grew up distributing anti-magic propaganda and so comes with a flyer proclaiming that Witches Live Among Us! His black coat is nicely detailed, though is completely unprinted on the back, and the dark grey legs are similarly undecorated. 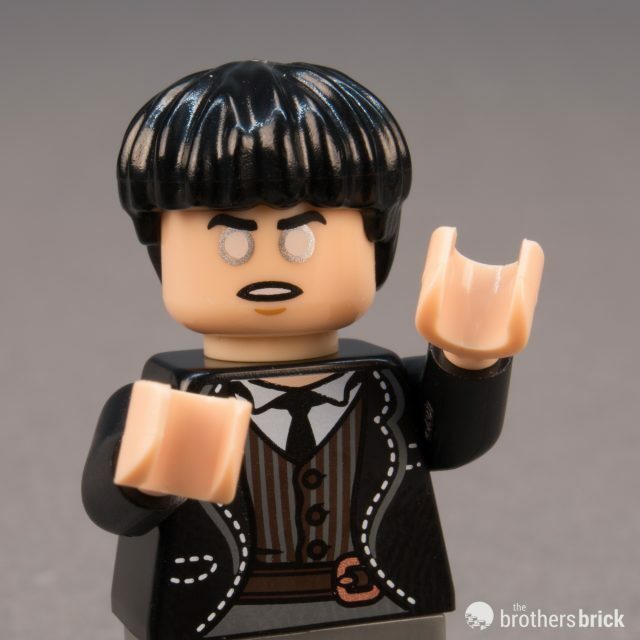 His black hair uses the classic bowl cut element introduced for the original Ron Weasley back in 2001. The head is reversible, with the alternate expression showing Credence’s white eyes when channeling of the Obscurus. 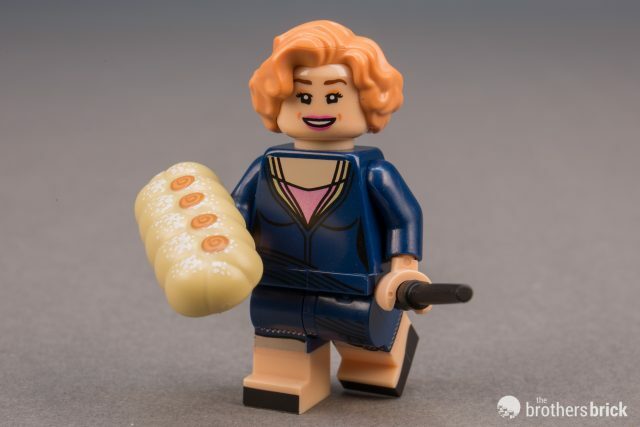 Compared to many of the other characters in the series, this minifigure feels a bit underdeveloped. 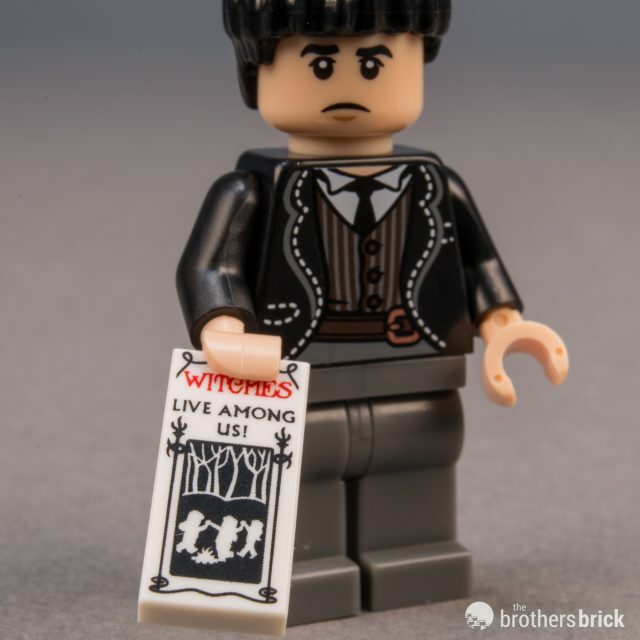 Credence is a bit too plain with only two printed elements on the figure (head and torso front) and a single accessory. The austere Director of Magical Security for MACUSA, Percival Graves is not a man you’d want to cross. Graves wears a fancy black suit and robes that stretch down the legs, a long dark blue scarf, and is the only figure in this series to feature arm printing, with a white pinstripe extending along each arm. Graves’ slicked back hair is not a new element, though it’s newly printed with a grey fringe around the back. Graves carries a dark tan wand. 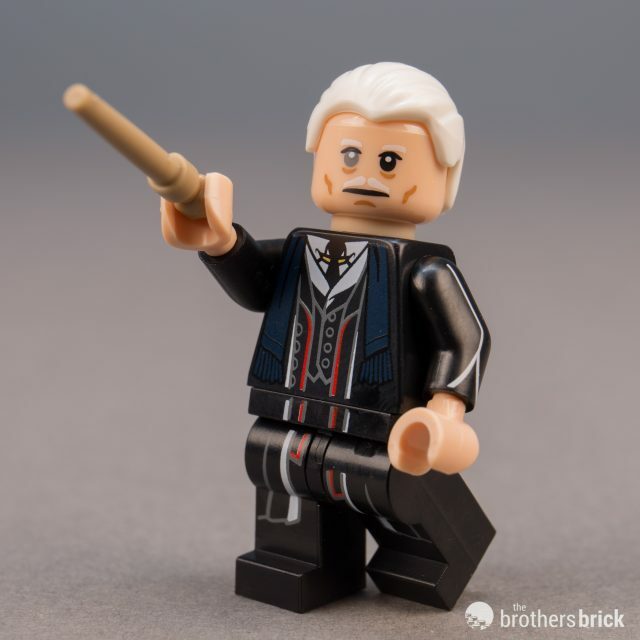 However, much like Mad-Eye Moody, not all is as it seems, as he can transform into the much more deadly Gellert Grindelwald with the flick of a wand. 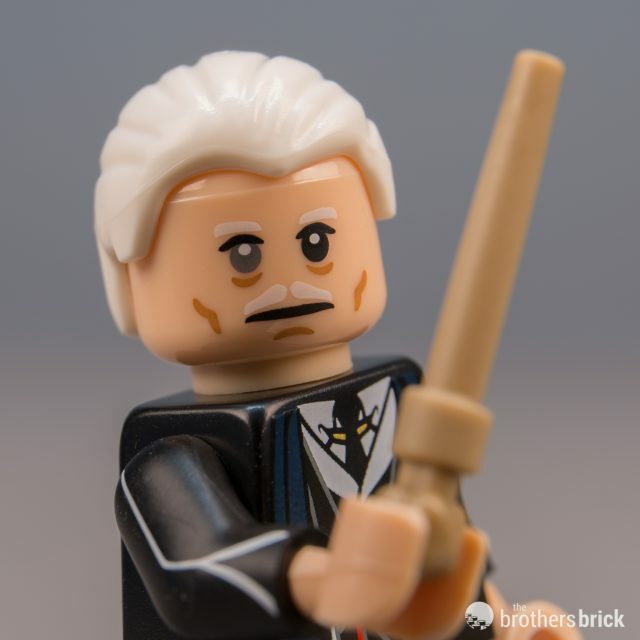 Grindelwald’s white hair is included, and the head reverses showing the notorious villain’s white-mustachioed face. 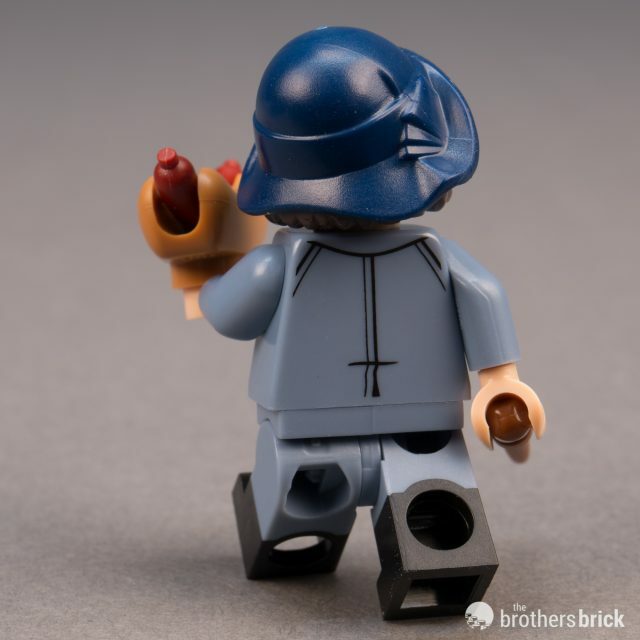 As is often the case with rare chase figures, there’s nothing inherently special about this character, beyond the fact that LEGO chose to dole it out more sparingly than the others. 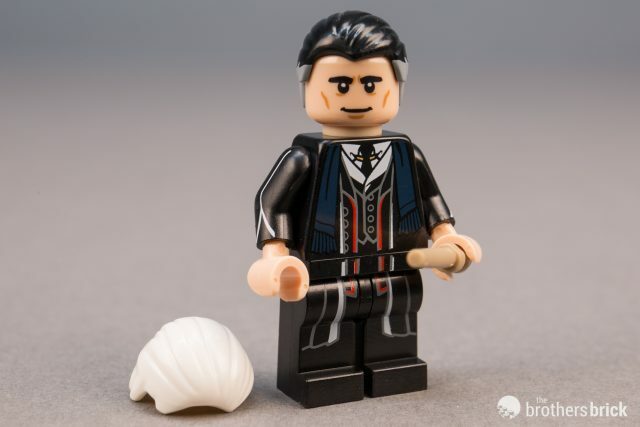 A good guess would be that LEGO’s marketing department thought it would be clever to mimic the in-universe manhunt for Grindelwald by forcing a similar hunt on kids and fans. LEGO has done an excellent job with this series, filling in many gaps and bringing new life to many woefully outdated characters. The multitude of new elements is in keeping with the traditional CMF series, and the detail on the characters is excellent. 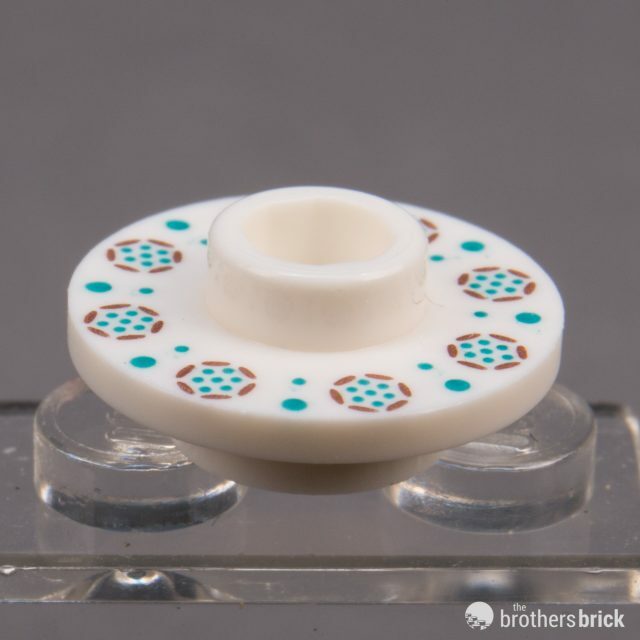 We didn’t notice any of the plastic quality issues that have sometimes plagued CMFs, which is a refreshing turn. Let us know in the comments which characters you’re most excited for, and watch out for our Feel Guide soon! 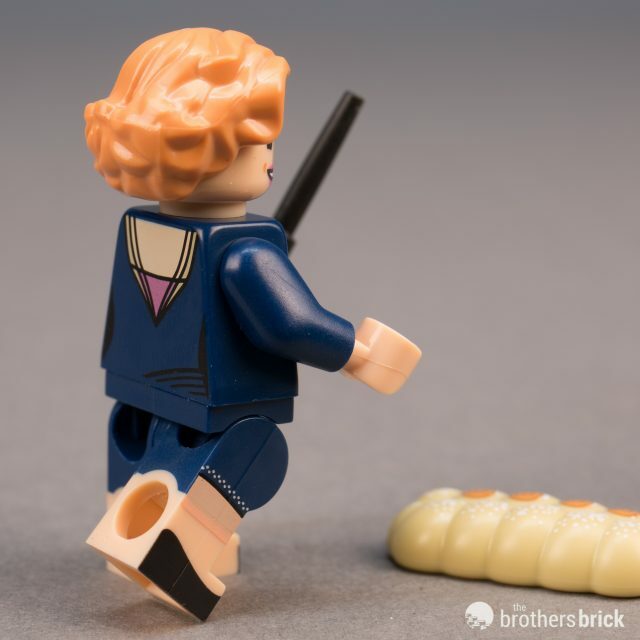 71022 Harry Potter & Fantastic Beasts Collectible Minifigures will be available at the LEGO Shop beginning Aug 1. for $3.99 each. You do know there are “dots” imprinted on bottom of each minifigure bag. Decode the dots and you know which figure is in each bag. Has been that way since the very first series. @Todd, yes, we are aware of the dots. The dots take more time to decipher than just feeling the bags, and are generally more prone to interpretation error. Dumbledore’s head without the beard piece looks like Steven Spielberg. How much is it to buy the whole box? Yes! Even being a bigger fan of the original HP series, I can’t wait to get some Jacob Kowalskis! Is it too early for me to wish Harry Potter Series 2 already? @david, it is not to early, I wish we were at series 4! There already is a dementor in the Hogwarts express set, and a mcgonagall and a sorting hat in the great hall set. I really want those teen legs! I knoooowwww I want them so bad! How can we wait for August!? And when will we see them in normal sets! It’s likely the best Dumbledore of all time. 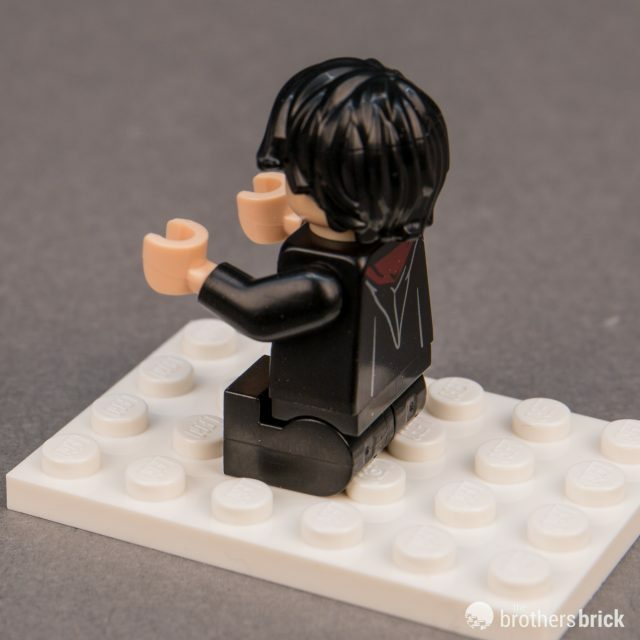 Same probably with Voldemort, but it would be nice to see him in Black. 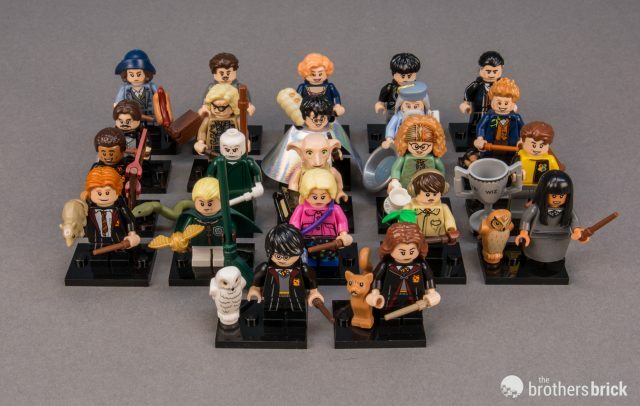 Mad Eye, Luna, and Dean Thomas are standouts for me, also maybe Cho and Dumbledore. 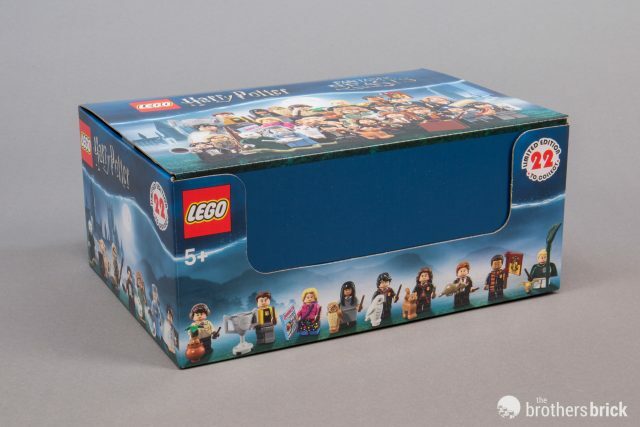 hello, where can buy the box and how many cost it?